Star Wars Datapad is the ultimate chronological timeline and release date list for Star Wars media in the official canon. All movies, TV series, novels, young adult and middle-grade books (combined), comics, reference books, and short stories are listed here in their own categories. The only thing not covered¹ are pre-school books, children’s activity books, or Legends non-fiction and reprints. Unconfirmed info is underlined for easy reference. Any unannounced information is marked as ??? and years include a “c.” (circa) when only estimates are known until a more accurate time is determined. For example, if a story is listed as taking place in c. 0 ABY, then that story is definitely set in 0 ABY but it’s not known which two stories it takes place between and is arranged based on the best estimation. A story listed as c. 0-4 ABY takes place at some point between those years while a story listed as 0-4 ABY takes place across those multiple years. 10/17/2017 10/17/17 Movie Solo is the title of the previously untitled Young Han Solo movie. 10/09/2017 10/9/17 Poster Episode VIII: Last Jedi, The (Movie) poster art. 09/20/2017 9/20/17 Date Rebels: S4E09 - Rebel Assault to Nov. 13 (was ?? ?, 2017). 09/20/2017 9/20/17 Date Rebels: S4E08 - Crawler Commanders to Nov. 6 (was ?? ?, 2017). 09/20/2017 9/20/17 Date Rebels: S4E07 - Kindred to Nov. 6 (was ?? ?, 2017). 09/12/2017 9/12/17 Info Episode IX (Movie) to be co-written by J.J. Abrams and Chris Terrio (was Collin Trevorrow & Derek Connelly). 09/12/2017 9/12/17 Info Episode IX (Movie) to be directed by J.J. Abrams (was ???). 09/12/2017 9/12/17 Date Rebels: S4E06 - Flight of the Defender to Oct. 30 (was ?? ?, 2017). 09/12/2017 9/12/17 Date Rebels: S4E05 - The Occupation to Oct. 30 (was ?? ?, 2017). 09/12/2017 9/12/17 Date Rebels: S4E03-04 - In the Name of the Rebellion to Oct. 23 (was ?? ?, 2017). 09/09/2017 9/9/17 Info Episode IX (Movie) to be directed and written by J.J. Abrams (was Colin Trevorrow). 09/09/2017 9/9/17 Date Episode IX (Movie) to Dec. 20, 2019 (was Dec. ? ?, 2019). 09/05/2017 9/5/17 Info Episode IX (Movie) to be directed by ??? (was Colin Trevorrow). 06/25/2017 6/25/17 Site News Updates Sorry for the lack of updates since Celebration, I've been adjusting to a new job. This site is still a priority for me and I plan on being back on schedule soon with updates once again being posted within 24 hours of news. As of today, the major updates have been completed. 06/22/2017 6/22/17 Info ??? (Young Han Solo) (Movie) to be directed by Ron Howard (was Christopher Miller and Phil Lord). 05/19/2017 5/19/17 Comic One-Shot Cassian & K-2SO at 40-pages in August written by Duane Swierczynski and illustrated by Fernando Blanco set in c. ? ?-0 BBY. 05/18/2017 5/18/17 Comic Mini-Series Jedi of the Republic: Mace Windu a 5-issue mini-series in August written by Matt Owens and illustrated by Denys Cowan set in c. 22-21 BBY. 04/25/2017 4/25/17 Date Episode IX (Movie) to May 24, 2019 (was Dec. ? ?, 2019). 04/15/2017 4/15/17 Info Rebels (TV Series) to end with Season 4. 04/15/2017 4/15/17 Novel Phasma by Delilah S. Dawson. 04/14/2017 4/14/17 Comic Mini-Series Captain Phasma a 4-issue mini-series in September written by Kelly Thompson and illustrated by Marco Checchetto set in 34 ABY. 04/11/2017 4/11/17 Info Blade Squadron: Jakku (Short Story) to Insider #172 (was Insider #171). 04/08/2017 4/8/17 Date Darth Maul #5 to July 19 (was June 21). 04/08/2017 4/8/17 Date Darth Maul #4 to June 21 (was May 24). 04/07/2017 4/7/17 Timeline From a Certain Point of View to c. 0 BBY/ABY (was ???) during "A New Hope". 04/07/2017 4/7/17 Cover From a Certain Point of View (Short Story Anthology) cover art. 04/07/2017 4/7/17 Info From a Certain Point of View (Short Story Anthology) to be written by John Jackson Miller, Gary Whitta, Paul Dini, Claudia Gray, Paul S. Kemp, Alexander Freed, Jason Fry, Christie Golden, Cavan Scott, Ben Acker & Ben Blacker, Delilah S. Dawson, E. K. Johnston & Ashley Eckstein, Meg Cabot, Tom Angleberger, Mur Lafferty, Griffin McElroy, Adam Christopher, Ken Liu, Zoraida Cordova, Daniel José Older, Chuck Wendig, Mallory Ortberg, Madeleine Roux, Gary D. Schmidt, Renee Ahdieh, Sabaa Tahir, Glen Weldon, Rae Carson, Nnedi Okorafor, and more to be announced. 04/07/2017 4/7/17 Date From a Certain Point of View (Short Story Anthology) to October 3 (was ??? 2017). 04/07/2017 4/7/17 Info From a Certain Point of View (Short Story Anthology) (was Operation: Blue Milk) to 400 pages (was ???). 04/06/2017 4/6/17 Animated Micro-Series Forces of Destiny to July 2017 on YouTube and Disney Channel in Fall 2017. At least 6 episodes 2-3 minutes long. 04/06/2017 4/6/17 Short Story Anthology Operation: Blue Milk in ??? 2017 by dozens of authors to be announced. Short stories are new. 03/21/2017 3/21/17 Comic One-Shot Droids Unplugged #1 on June 28 collecting the three bonus comics "SaBBotage", "Droid Dilemma", and "Probe Droid Problem" originally published in Poe Dameron #1, Star Wars #25, and Darth Maul #1. 03/21/2017 3/21/17 Date Doctor Aphra #8 to June 28. 03/21/2017 3/21/17 Date Poe Dameron #16 to June 28. 03/21/2017 3/21/17 Date Darth Vader: Dark Lord of the Sith #2 to June 21. 03/21/2017 3/21/17 Date Darth Maul #5 to June 21. 03/21/2017 3/21/17 Date Poe Dameron: Annual #1 to June 21. 03/21/2017 3/21/17 Date Star Wars #32 to June 14. 03/21/2017 3/21/17 Date Darth Vader: Dark Lord of the Sith #1 to June 7. 03/21/2017 3/21/17 Date Rogue One #3 to June 7. 03/17/2017 3/17/17 Cover Adventures in Wild Space #4: The Darkness (YA Book) cover art. 03/15/2017 3/15/17 Cover On the Front Lines (Reference) cover art. 03/10/2017 3/10/17 Comic Series Darth Vader: Dark Lord of the Sith ongoing series in June written by Charles Soule and illustrated by Guiseppe Camuncoli. Set in 19 BBY "one second" after Revenge of the Sith. 03/06/2017 3/6/17 Trade Paperback Darth Maul: Son of Dathomir collects Darth Maul: Son of Dathomir #1-4 on Nov. 21. 03/06/2017 3/6/17 Trade Paperback Poe Dameron - Vol. 3 collecting Poe Dameron #14-19 on Oct. 31. 02/22/2017 2/22/17 Digital HD Rogue One to Mar. 24. 02/22/2017 2/22/17 DVD/Blu-ray Rogue One to Apr. 4 (was May 2). 02/21/2017 2/21/17 Story Arc ??? spans Poe Dameron #14-19. 02/21/2017 2/21/17 Date Doctor Aphra #7 to May 31. 02/21/2017 2/21/17 Date Darth Maul #4 to May 24. 02/21/2017 2/21/17 Date Poe Dameron #15 to May 17. 02/21/2017 2/21/17 Date Star Wars #31 to May 17. 02/21/2017 2/21/17 Date Screaming Citadel #1 to May 10. 02/21/2017 2/21/17 Date Rogue One #2 to May 3. 02/21/2017 2/21/17 Date Poe Dameron #14 to May 3. 02/21/2017 2/21/17 Hardcover Trade Darth Vader Omnibus collects Darth Vader #1-25 / Annual #1 / Vader Down #1 / Star Wars #13-14 on Sept. 6. 02/21/2017 2/21/17 Info Poe Dameron - Vol. 2: Gathering Storm, The (Trade Paperback) collects Poe Dameron #8-13 (was Poe Dameron #7-13). 02/20/2017 2/20/17 Non-Fiction Making Rogue One by Josh Kushins on Oct. 3. 02/20/2017 2/20/17 Trade Paperback Rogue One collecting Rogue One #1-6 on Dec. 5. 02/20/2017 2/20/17 Trade Paperback Force Awakens, The collecting The Force Awakens #1-6 on Nov. 21. 02/20/2017 2/20/17 Trade Paperback Screaming Citadel collects Screaming Citadel #1 / Star Wars #31-31 / Doctor Aphra #7-8 on Oct. 24. 02/20/2017 2/20/17 Trade Paperback Darth Maul collects Darth Maul #1-5 on Sept. 5. 02/17/2017 2/17/17 Novel Inferno Squad on July 25 by Christie Golden. Set in c. 0-1 ABY. 02/15/2017 2/15/17 Cover Adventures in Wild Space #3: The Heist (YA Book) cover art. 02/12/2017 2/12/17 Reference Absolutely Everything You Need to Know - Updated and Expanded on Nov. 7. An updated edition of the canon release (w/ 256 pages vs. 200 in previous edition). 02/08/2017 2/8/17 Date Rebels: S3E22 - Zero Hour: Pt. II to Mar. 25. 02/08/2017 2/8/17 Date Rebels: S3E21 - Zero Hour: Pt. I to Mar. 25. 02/08/2017 2/8/17 Date Rebels: S3E20 - Twin Suns to Mar. 18. 02/08/2017 2/8/17 Date Rebels: S3E19 - Double Agent Droid to Mar. 11. 02/08/2017 2/8/17 Date Rebels: S3E18 - Secret Cargo to Mar. 4. 02/08/2017 2/8/17 Comic One-Shot Screaming Citadel in May leading in to crossovers with Star Wars and Doctor Aphra in issues #31-32 and #7-8 respectively. Written by Kieron GIllen and drawn by Marco Checchetto. 02/02/2017 2/2/17 Info Ahsoka (YA Book) is getting a paperback release on Mar. 9. 01/26/2017 1/26/17 Cover Guardians of the Whills (YA Book) cover art. 01/26/2017 1/26/17 Info Guardians of the Whills (YA Book) is the title of the Rogue One: Baze & Chirrut book. 01/26/2017 1/26/17 Timeline Rebel Rising to c. 13-0 BBY (was c. 1-0 BBY). 01/25/2017 1/25/17 Cover Rebel Rising (YA Book) cover art. 01/25/2017 1/25/17 Info Rebel Rising (YA Book) is the title of the Rogue One: Jyn Erso book. 01/24/2017 1/24/17 Date Darth Maul #3 to Apr. 26. 01/24/2017 1/24/17 Date Poe Dameron #13 to Apr. 19. 01/24/2017 1/24/17 Date Doctor Aphra #6 to Apr. 12. 01/24/2017 1/24/17 Date Rogue One #1 to Apr. 5 (was Apr. ??). 01/24/2017 1/24/17 Date Star Wars #30 to Apr. 5. 01/23/2017 1/23/17 Movie The Last Jedi is the title of Episode VIII. 01/12/2017 1/12/17 Comic Adaptation (6-parts) Rogue One in Apr. will be written by Jody Houser and illustrated by Emilio Laiso. 01/07/2017 1/7/17 Site News The Clone Wars The recent release of the reference book Galactic Maps allowed me to confirm most of the timeline for episodes of The Clone Wars. Nearly every single episode's year can now be proven. There were about 5-7 inconsistencies in the book that conflicted with the official episode order so I've attributed those as simply errors in the book. In addition, I've added two columns: one for episode arcs and another for the central character(s) of each episode. The titles of the episode arcs are unofficial and simply for your reference. It's not 100% finished yet. 01/05/2017 1/5/17 Date Rebels: S3E17 - Through Imperial Eyes to Feb. 25. 01/05/2017 1/5/17 Date Rebels: S3E16 - Legacy of Mandalore to Feb. 18. 01/03/2017 1/3/17 Timeline Darth Maul to c. 36-32 BBY (was c. 54-32 BBY). "This series takes place shortly before the events of The Phantom Menace." so I chose to place the series no further back than 36 BBY. 12/24/2016 12/24/16 Date Rebels: S3E15 - Trials of the Darksaber to Jan. 21. 12/24/2016 12/24/16 Date Rebels: S3E14 - Warhead to Jan. 14. 12/20/2016 12/20/16 Date Darth Maul #2 to Mar. 22. 12/20/2016 12/20/16 Date Poe Dameron #12 to Mar. 15. 12/20/2016 12/20/16 Date Doctor Aphra #5 to Mar. 8. 12/20/2016 12/20/16 Date Star Wars #29 to Mar. 1. 12/16/2016 12/16/16 Timeline The Voice of the Empire to c. 19-17 BBY (was c. 1-0 BBY). 12/16/2016 12/16/16 Cover The Voice of the Empire (Insider #170) (Short Story) cover art. 12/16/2016 12/16/16 Info The Voice of the Empire (Short Story) is the title that appears in Insider #170 (was Voices of the Empire). 12/08/2016 12/8/16 Cover Star Wars: Visual Encyclopedia (Reference) cover art. 12/07/2016 12/7/16 Timeline Adventures in Wild Space to c. 10-5 BBY (was c. 19 BBY - 4 ABY). "Set just before the events of Star Wars Rebels" so I chose to place the series no further back than 10 BBY. 12/07/2016 12/7/16 Cover Star Wars: The Prequel Trilogy (Graphic Novel) cover art. 12/07/2016 12/7/16 Cover Rogue One (Junior Novelization) updated cover art. 12/07/2016 12/7/16 Cover Join the Resistance #1 (YA Book) cover art. 12/07/2016 12/7/16 Cover The Escape (YA Book) cover art. 12/07/2016 12/7/16 Info The Snare / The Escape (YA Book) The Snare is confirmed to not include the prelude, The Escape, which will be available separately and exclusively as an eBook. 12/07/2016 12/7/16 Timeline Doctor Aphra #1 Backup Story to c. 10-1 BBY (was c. 0-1 ABY). The caption says "Years ago" and Aphra doesn't look too much younger so I chose to estimate no further back than 10 BBY. 12/07/2016 12/7/16 Info Doctor Aphra #1 Backup Story is untitled but will be treated as a separate entry in the timeline since it can be a standalone story from the Aphra story arc, is set in a different time period, and has a different artist. 12/07/2016 12/7/16 Story Arc Aphra is the title of the story arc in Doctor Aphra #1-?? (was ???). 12/07/2016 12/7/16 Timeline Join the Resistance #1-2 to c. 34 ABY after "Before the Awakening" (was c. 28+). 12/07/2016 12/7/16 Info Join the Resistance (YA Series) is written by Ben Blacker and Ben Acker. 12/06/2016 12/6/16 Site News Rebels Mini-Comics A dedicated page for the Rebels Mini-Comics has finally been added. These are the 12 page comics found in Star Wars: Rebels - Magazine. The page isn't mobile-friendly yet and there's some minor funcitonality and visual aspects that I'll be fixing today. 12/03/2016 12/3/16 Date Rebels: S3E13 - Ghosts of Geonosis: Pt. II to Jan. 7. 12/03/2016 12/3/16 Date Rebels: S3E12 - Ghosts of Geonosis: Pt. I to Jan. 7. 12/01/2016 12/1/16 Site News Major Announcement TMBGeeks (They Might Be Geeks) has changed it's name to Star Wars Datapad (or the shortened version SWDatapad.com)! We're hoping the new name will draw more readers and let people know right away that our site is all about Star Wars. The TMBGeeks name will be incorporated into a new site soon that will serve as a hub for SWDatapad and other ideas I'm working on. What do you think of the new name? Come tell me @StarWarsDatapad! 11/30/2016 11/30/16 Comic Annual Star Wars: Annual #2 story is confirmed to be simply titled "Annual #2" (was Annual #2). 11/25/2016 11/25/16 Info Yoda's Secret War (Story Arc) spans Star Wars #26-31 (was Star Wars #26-??). 11/25/2016 11/25/16 Story Arc Yoda's Secret War is the title of the story arc in Star Wars #26-31 (was Ben Kenobi Journal #4). 11/24/2016 11/24/16 Date Poe Dameron - Vol. 2: Gathering Storm, The (TPB) to July 4 (was June 20). 11/23/2016 11/23/16 Timeline Droid Dilemma to c. 0-3 ABY (was ???). 11/23/2016 11/23/16 Comic Backup Story Droid Dilemma is the title of the Star Wars #25 R2-D2 backup story. 11/23/2016 11/23/16 Info Bloodline (Paperback) will include "Scorched", the short story from Insider #165. 11/22/2016 11/22/16 Cover Blade Squadron: Jakku (Insider #171) (Short Story) cover art. 11/22/2016 11/22/16 Date Blade Squadron: Jakku (Insider #171) (Short Story) to Feb. 14 (was Jan.-Feb. ? ?, 2017). 11/22/2016 11/22/16 Date Poe Dameron #11 to Feb. 15 (was Feb. ??). 11/22/2016 11/22/16 Date Doctor Aphra #4 to Feb. 8 (was Feb. ??). 11/22/2016 11/22/16 Date Star Wars #28 to Feb. 1 (was Feb. ??). 11/22/2016 11/22/16 Date Darth Maul #1 to Feb. 1 (was Feb. ??). 11/17/2016 11/17/16 Date Rogue One (Novel) to Dec. 20 (was Jan. 3). 11/14/2016 11/14/16 Comic Mini-Series (5-parts) Darth Maul in Feb. written by Cullen Bunn and illustrated by Luke Ross. Set in c. 54-32 BBY. 11/11/2016 11/11/16 Timeline Catalyst to c. 14-11 BBY between "Tarkin" and "A New Dawn" (was c. 1-0 BBY). 11/09/2016 11/9/16 Cover Rogue One (Novel) cover art. 11/05/2016 11/5/16 Comic Backup Story ??? in Doctor Aphra #1 will be 10 pages and drawn by Salvador Larroca. 11/03/2016 11/3/16 Info BBY/ABY Dating System is used in-universe in Galactic Maps (Galactic Atlas for UK readers). 11/03/2016 11/3/16 Story Arc Poe Dameron #8-10 is called The Gathering Storm (Book III) and is not to be confused with the one-shot Poe Dameron #7 that is also called "The Gathering Storm" but is not labeled as "Book III". 11/03/2016 11/3/16 YA Book The Rescue is the title of Adventures in Wild Space #6. 11/01/2016 11/1/16 Trade Paperback Star Wars - Vol. 5 collecting Star Wars #26-31 on July 18. 10/29/2016 10/29/16 Date Rebels: S3E11 - Visions and Voices to Dec. 10. 10/29/2016 10/29/16 Date Rebels: S3E10 - An Inside Man to Dec. 3. 10/25/2016 10/25/16 Story Arc ??? spans Poe Dameron #11-13. 10/25/2016 10/25/16 Trade Paperback Poe Dameron - Vol. 2 collecting Poe Dameron #7-13 on June 20. 10/25/2016 10/25/16 Hardcover Trade Star Wars - Vol. 2 (Hardcover) collecting Star Wars #15-25 and SW Annual #2 on June 20. 10/23/2016 10/23/16 Date On the Front Lines (Reference) to July 18 (was Fall 2017). 10/20/2016 10/20/16 Comic One-Shot Gathering Storm, The is the title of the one-shot story in Poe Dameron #7. 10/18/2016 10/18/16 Date Star Wars #27 to Jan. 25. 10/18/2016 10/18/16 Date Doctor Aphra #3 to Jan. 18. 10/18/2016 10/18/16 Date Poe Dameron #10 to Jan. 11. 10/18/2016 10/18/16 Info Doctor Aphra (Story Arc) spans issues #1-6 (was Doctor Aphra #1-??). 10/18/2016 10/18/16 Trade Paperback Doctor Aphra collecting Doctor Aphra #1-6 on July 4. 10/17/2016 10/17/16 Date Darth Vader - Vol. 2 (Hardcover) to Feb. 28 (was Feb. 20). 10/17/2016 10/17/16 Date Han Solo #5 to Nov. 23 (was Nov. 9). 10/12/2016 10/12/16 Poster Rogue One (Movie) poster art. 10/12/2016 10/12/16 Timeline Doctor Aphra to c. 0-1 ABY after "End of Games" (was ???). 10/12/2016 10/12/16 Comic Series Doctor Aphra is the title of the Classified ongoing series. 10/12/2016 10/12/16 Comic Backup Story Darth Vader - Book IV: Coda is the title of the Darth Vader #25 backup story. 10/12/2016 10/12/16 Date Rebels: S3E09 - Wyankahthu Job, The to Nov. 26. 10/12/2016 10/12/16 Date Rebels: S3E08 - Iron Squadron to Nov. 19. 10/12/2016 10/12/16 Date Rebels: S3E07 - Imperial Supercommandos to Nov. 5. 10/08/2016 10/8/16 Date Star Wars: The Prequel Trilogy (Graphic Novel) to Apr. 4 (was Apr. 11). 10/07/2016 10/7/16 Info Rogue One (Junior Novelization) is written by Matt Forbeck. 10/07/2016 10/7/16 Info Rogue One: Jyn Erso (YA Book) is written by Beth Revis. 10/07/2016 10/7/16 Info Rogue One: Baze & Chirrut (YA Book) is written by Greg Rucka. 10/07/2016 10/7/16 Cover Adventures in Wild Space #4: The Darkness (YA Book) cover art removed since new art will presumably match the first two books. 10/07/2016 10/7/16 Cover Adventures in Wild Space #3: The Heist (YA Book) cover art removed since new art will presumably match the first two books. 10/07/2016 10/7/16 Cover Adventures in Wild Space #2: The Nest (YA Book) cover art updated for U.S. version. 10/07/2016 10/7/16 Cover Adventures in Wild Space #1: The Snare (YA Book) cover art updated for U.S. version. 10/06/2016 10/6/16 Info End of Games (Story Arc) concludes in Darth Vader #25 (was Darth Vader #25). 10/03/2016 10/3/16 Date The Making of Star Wars: The Force Awakens (Non-Fiction) to ??? (was Oct. 25, 2016) after Amazon pre-order was officially removed. Likely canceled. 09/25/2016 9/25/16 Cover Galactic Maps (Reference) cover art. 09/24/2016 9/24/16 Date Poe Dameron #8 to Nov. 9 (was Nov. 2). 09/20/2016 9/20/16 Date Voices of the Empire (Insider #170) (Short Story) to Dec. 13 (was Dec. ??). 09/20/2016 9/20/16 Date Star Wars #26 to Dec. 28 (was ???). 09/20/2016 9/20/16 Date Classified #2 to Dec. 21 (was Dec. ??). 09/20/2016 9/20/16 Date Poe Dameron #9 to Dec. 14 (was ???). 09/20/2016 9/20/16 Date Classified #1 to Dec. 7 (was Dec. ??). 09/19/2016 9/19/16 Comic Series Classified ongoing series in December. 09/19/2016 9/19/16 Info Adventures in Wild Space (YA Series) is confirmed to conclude in the untitled book #6. 09/19/2016 9/19/16 YA Book The Cold is the title of Adventures in Wild Space #5. 09/16/2016 9/16/16 Story Arc Ben Kenobi Journal #4 in Star Wars #26-?? is set in c. 44-32 BBY. 09/10/2016 9/10/16 Date Rebels: S3E06 - The Last Battle to Oct. 22. 09/10/2016 9/10/16 Date Rebels: S3E05 - Hera's Heroes to Oct. 15. 09/10/2016 9/10/16 Date Rebels: S3E04 - The Antilles Extraction to Oct. 8. 09/10/2016 9/10/16 Date Rebels: S3E03 - The Holocrons of Fate to Oct. 1. 09/08/2016 9/08/16 Date Adventures in Wild Space #6 (YA Book) to Apr. 10, 2018 (was ???). 09/08/2016 9/08/16 Date Adventures in Wild Space #5 (YA Book) to Nov. 7, 2017 (was ???). 09/07/2016 9/7/16 Date On the Front Lines (Reference) to Fall 2017 (was Fall 2016). 09/02/2016 9/2/16 Timeline Thrawn to c. ? ?-2 BBY (was c. ? ?-3 BBY). 09/02/2016 9/2/16 Timeline Rebels: Season 4 to c. 2-0 BBY (was c. 3-0 BBY). 09/02/2016 9/2/16 Timeline Rebels: Season 3 to 2 BBY (was c. 3 BBY). 08/30/2016 8/30/16 Date Blade Squadron: Kuat (Insider #168) (Short Story) to Sept. 6 (was Aug. 30). 08/30/2016 8/30/16 Date Star Wars: The Prequel Trilogy (Graphic Novel) to Apr. 11 (was Apr. ??). 08/30/2016 8/30/16 Info Star Wars: The Prequel Trilogy (Graphic Novel) is confirmed as the title (was Star Wars: The Prequel Trilogy). 08/23/2016 8/23/16 Comic Annual Star Wars: Annual #2 on Nov. 30 set in c. 0-4 ABY. 08/23/2016 8/23/16 Comic Backup Story R2-D2 in Star Wars #25 will be 8 pages written and drawn by Chris Eliopoulos. 08/23/2016 8/23/16 Date The Force Awakens #6 to Nov. 9 (was Nov. 16). 08/23/2016 8/23/16 Date Poe Dameron #8 to Nov. 2 (was Nov. 30). 08/20/2016 8/20/16 Cover Rogue One: A Junior Novel (Adaptation) cover art. 08/20/2016 8/20/16 Cover Rogue One YA Book (YA Book) cover art. 08/20/2016 8/20/16 Cover Rogue One: Baze & Chirrut (YA Book) cover art. 08/20/2016 8/20/16 Info Rogue One: Baze & Chirrut (YA Book) is the title of the Rogue One: Character Story. 08/18/2016 8/18/16 TV Season Star Wars Rebels: Season 4 in Fall 2017. No word yet on episode count. 08/18/2016 8/18/16 Date Darth Vader #25 to Oct. 12 (was Oct. 5). 08/18/2016 8/18/16 Cover Poe Dameron #7 gets a new cover since it's now a one-shot story and the old cover and contents is shifted to Poe Dameron #8. 08/17/2016 8/17/16 Date Aftermath: Empire's End (Novel) to Feb. 21 (was Jan. 31). 08/16/2016 8/16/16 Date Poe Dameron #8 to Nov. 30 (was ???). 08/16/2016 8/16/16 Date Star Wars #25 to Nov. 23 (was ???). 08/16/2016 8/16/16 Date The Force Awakens #6 to Nov. 16 (was ???). 08/15/2016 8/15/16 Story Arc ??? spans Poe Dameron #8-10. 08/15/2016 8/15/16 Comic One-Shot ??? in Poe Dameron #7. 08/09/2016 8/9/16 DVD/Blu-ray Rogue One is rumored to be released on May 2 due to several book release dates being moved to that date. 08/09/2016 8/9/16 Date Rogue One: YA Book (YA Book) to May 2 (was Mar. 28). 08/09/2016 8/9/16 Date Rogue One: Character Story (YA Book) to May 2 (was Mar. 28). 08/08/2016 8/8/16 Date Rebels: S3E01-02 - Steps Into Shadow to Sept. 24 (was Fall 2016). 08/08/2016 8/8/16 Date Star Wars: The Prequel Trilogy (Graphic Novel) to Apr. ?? (was ???). 08/05/2016 8/5/16 Reference Star Wars: Visual Encyclopedia on Apr. 4, 2017 by Adam Bray at 360 pages. 08/05/2016 8/5/16 Date Han Solo #5 to Nov. 9 (was Oct. 19). 08/05/2016 8/5/16 Date Poe Dameron #7 to Oct. 26 (was Oct. 5). 08/05/2016 8/5/16 Date Han Solo #4 to Oct. 12 (was Sept. 28). 08/05/2016 8/5/16 Date Darth Vader #25 to Oct. 5 (was Aug. 31). 08/03/2016 8/3/16 Date Thrawn (Novel) to Apr. 11 (was Apr. 11). 07/27/2016 7/27/16 Cover The Art of Rogue One (Reference) cover art. 07/27/2016 7/27/16 Cover The Force Awakens: The Story of the Movie in Comics (Graphic Novel) cover art. 07/26/2016 7/26/16 YA Book Adventures in Wild Space #4: The Darkness to be published in the U.S. on Aug. ? ?, 2017. The original U.K. title was "The Dark". 07/23/2016 7/23/16 Date Adventures in Wild Space #2: The Nest (YA Book) to Jan. 3 (was Nov. 15). 07/23/2016 7/23/16 Date Adventures in Wild Space #1: The Snare (YA Book) to Jan. 3 (was Nov. 15). 07/19/2016 7/19/16 Graphic Novel Star Wars: The Prequel Trilogy on ???. 07/19/2016 7/19/16 Graphic Novel The Force Awakens: The Story of the Movie in Comics on Oct. 17 at 76 pages and written by Alessandro Ferrari and art by Alessandro Pastrovicchio. 07/19/2016 7/19/16 Date Star Wars #24 to Oct. 26 (was ???). 07/19/2016 7/19/16 Date Han Solo #5 to Oct. 19 (was ???). 07/19/2016 7/19/16 Date The Force Awakens #5 to Oct. 12 (was ???). 07/19/2016 7/19/16 Date Poe Dameron #7 to Oct. 5 (was ???). 07/19/2016 7/19/16 Info Lockdown (Story Arc) concludes in Poe Dameron #6 (was Poe Dameron #??). 07/19/2016 7/19/16 Info Star Wars - Vol. 4 (Trade Paperback) collects Star Wars #20-25 (was Star Wars #21-??). 07/19/2016 7/19/16 Info Star Wars - Vol. 3 (Trade Paperback) collects Star Wars #15-19 / SW Annual #1 (was Star Wars #15-20 / SW Annual #1). 07/19/2016 7/19/16 Info The Last Flight of the Harbinger (Story Arc) concludes in Star Wars #25 (was Star Wars #??). 07/18/2016 7/18/16 Date Turning Point (Insider #169) (Short Story) to Oct. 25 (was Oct. ??). 07/17/2016 7/17/16 Cover Turning Point (Insider #169) (Short Story) cover art. 07/17/2016 7/17/16 Cover Blade Squadron: Kuat (Insider #168) (Short Story) cover art. 07/17/2016 7/17/16 Timeline Thrawn to c. ? ?-3 BBY (was ???). Spans several years and ends "just before the opening of Rebels Season 3". 07/17/2016 7/17/16 Info Rogue One (Novel) is written by Alexander Freed. 07/16/2016 7/16/16 Novel Thrawn on Apr. 11 by Timothy Zahn. 07/16/2016 7/16/16 Comic Backup Story ??? in Darth Vader #25 will be 10 pages and drawn by Max Fiumara. Set during Darth Vader #1. 07/16/2016 7/16/16 Info Catalyst (Novel) is written by James Luceno. 07/16/2016 7/16/16 Cover Catalyst (Novel) cover art. 07/16/2016 7/16/16 Cover Rogue One: The Ultimate Visual Guide (Reference) cover art. 07/16/2016 7/16/16 Short Story Blade Squadron: Jakku (Insider #171) on Jan.-Feb. ?? by Mark Williams and David Williams. A tie-in to Aftermath: Empire's End set in c. 4-5 ABY. 07/16/2016 7/16/16 Short Story Voices of the Empire (Insider #170) on Dec. ?? by Mur Lafferty. A tie-in to Rogue One set in c. 1-0 BBY. 07/16/2016 7/16/16 Short Story Turning Point (Insider #169) on Oct. ?? by Jason Hough and set "just after Return of the Jedi" in 4 ABY. 07/16/2016 7/16/16 Short Story Blade Squadron: Kuat (Insider #168) on Aug. 30 by Mark Williams and David Williams. A tie-in to Aftermath: Life Debt set in c. 4-5 ABY. 07/16/2016 7/16/16 Date Catalyst (Novel) to Nov. 15 (was Oct. 4). 07/16/2016 7/16/16 Date Join the Resistance #2 (YA Book) to Nov. 11, 2017 (was Aug. 15, 2017). 07/15/2016 7/15/16 Poster Rogue One (Movie) teaser poster art. 07/15/2016 7/15/16 Timeline Ahsoka to c. 19-4 BBY (was c. 19-4 BBY). It begins "right after the events of Order 66". 07/15/2016 7/15/16 Cover Ahsoka (YA Book) cover art. 07/14/2016 7/14/16 Info Insider #167 does NOT include a new short story despite solicitation saying "And don't miss our amazing all-new fiction!". 07/11/2016 7/11/16 Site News 1 Year Anniversary!!! Announcing the first mobile-friendly Star Wars timeline! Now you can check TMBGeeks.com on your phone with 100% compatibility and no loss of features. 07/11/2016 7/11/16 Date Han Solo #4 to Sept. 28 (was Sept. 7). 07/11/2016 7/11/16 Date Han Solo #3 to Aug. 31 (was Aug. 3). 07/06/2016 7/6/16 Story Arc Poe Dameron #4-6 is called Lockdown. 07/06/2016 7/6/16 Info Black Squadron (Story Arc) concluded in Poe Dameron #3 (was Poe Dameron #6). 07/06/2016 7/6/16 Cover Aftermath: Empire's End (Novel) cover art. 07/05/2016 7/5/16 Timeline BBY/ABY Dating System is now officially canon according to preview pages from Galactic Maps. 07/05/2016 7/5/16 Reference Galactic Maps is also getting a U.S. release on Dec. 20 (known as Galactic Atlas in the U.K.). 06/28/2016 6/28/16 YA Book Adventures in Wild Space #3: The Heist to be published in the U.S. on Apr. 11. The original U.K. title was "The Steal". 06/27/2016 6/27/16 YA Book Adventures in Wild Space: The Escape prelude to the series to be included in the U.S. release of "The Snare" on Nov. 15. 06/25/2016 6/25/16 YA Book Adventures in Wild Space #2: The Nest to be published in the U.S. on Nov. 15. 06/25/2016 6/25/16 YA Book Adventures in Wild Space #1: The Snare to be published in the U.S. on Nov. 15. 06/25/2016 6/25/16 Young Adult Series Adventures in Wild Space "6 book series" to be published in the U.S. beginning on Nov. 15. Formerly a U.K. exclusive. No word on the shorter and non-essential prequel, The Escape. 06/22/2016 6/22/16 Date Ralph McQuarrie: Star Wars Art (Non-Fiction) to Sept. 27 (was Sept. 6). 06/21/2016 6/21/16 Info The Force Awakens (Comic Adaptation) will now be 6 issues (was 5 issues). 06/21/2016 6/21/16 Date Star Wars #23 to Sept. 28 (was ???). 06/21/2016 6/21/16 Date The Force Awakens #4 to Sept. 14 (was ???). 06/21/2016 6/21/16 Date Poe Dameron #6 to Sept. 7 (was ???). 06/21/2016 6/21/16 Date Han Solo #4 to Sept. 7 (was ???). 06/17/2016 6/17/16 Timeline TK-146275 to c. 11-4 BBY (was c. 11-2 BBY). 06/16/2016 6/16/16 Story Arc The Force Awakens mini-series is simply titled The Force Awakens. 06/16/2016 6/16/16 Timeline Han Solo to c. 0-1 ABY between Rebel Jail and The Last Flight of Harbinger (was c. 0-3 ABY). 06/16/2016 6/16/16 Timeline Chewbacca to between Showdown on the Smugglers' Moon and Vader Down (was before Heir to the Jedi). 06/14/2016 6/14/16 Date Darth Vader #23 to July 20 (was July 13). 06/13/2016 6/13/16 Trade Paperback Han Solo collecting Han Solo #1-5 on Jan. 3. 06/11/2016 6/11/16 Cover TK-146275 (Insider #166) (Short Story) cover art. 06/10/2016 6/10/16 Timeline TK-146275 to c. 11-2 BBY (was c. 11-2 BBY). 06/09/2016 6/9/16 Info Battlefront: Twilight Company (Paperback) will include "Inbrief", the short story from Insider #161. 06/09/2016 6/9/16 Story Arc Han Solo mini-series is simply titled Han Solo. 06/07/2016 6/7/16 Timeline TK-146275 has a short opening sequence set in 14 BBY but the main story still spans c. 11-2 BBY. 06/02/2016 6/2/16 Date TK-146275 (Insider #166) (Short Story) to June 14 (was June 7). 06/01/2016 6/1/16 Timeline Rogue One to 0 BBY (was c. 1-0 BBY). It reportedly ends 10 minutes before Episode IV: A New Hope. 05/30/2016 5/30/16 Date Episode IX: ??? (Movie) to Dec. ? ?, 2019 was (?? ? ?, 2019). 05/28/2016 5/28/16 Timeline TK-146275 to c. 11-2 BBY (was c. 11 BBY). 05/28/2016 5/28/16 Timeline TK-146275 to c. 11 BBY (was ???). 05/27/2016 5/27/16 Short Story TK-146275 (Insider #166) on June 7 by Sylvain Neuvel. 05/25/2016 5/25/16 Cover Finn's Story (Adaptation) cover art. 05/23/2016 5/23/16 Date Join the Resistance #1 (YA Book) to Mar. 7 was (Jan. 17). 05/23/2016 5/23/16 Date Rogue One Character Story (YA Book) to Mar. 28 was (Dec. 16). 05/23/2016 5/23/16 Date Rogue One YA Book (YA Book) to Mar. 28 was (Dec. 16). 05/17/2016 5/17/16 Canceled Rogue One (Comics) the untitled 3-issue mini-series and one-shot (and the corresponding trade paperback) have been canceled. 05/17/2016 5/17/16 Date Darth Vader #25 to Aug. 31 was (Aug. ??). 05/17/2016 5/17/16 Date The Force Awakens #3 to Aug. 24 was (???). 05/17/2016 5/17/16 Date Star Wars #22 to Aug. 24 was (???). 05/17/2016 5/17/16 Date Poe Dameron #5 to Aug. 17 was (???). 05/17/2016 5/17/16 Date Darth Vader #24 to Aug. 10 was (Aug. ??). 05/17/2016 5/17/16 Date Han Solo #3 to Aug. 3 was (???). 05/16/2016 5/16/16 Adaptation Finn's Story on Sept. 13. Retells "The Force Awakens" from Finn's perspective. 05/14/2016 5/14/16 Cover Propaganda (Reference) cover art. 05/14/2016 5/14/16 Date Aftermath: Empire's End (Novel) to Jan. 31 (was Jan. 17). 05/13/2016 5/13/16 Info Darth Vader (Comic Series) to end with issue #25. 05/11/2016 5/11/16 Info Darth Vader #20 (Comic) Reminder: This issue's opening crawl is incorrectly titled "Book III, Part V: The Shu-Torun War" when it is actually "Book IV, Part I: End of Games". You can find confirmation from the editor here. 05/10/2016 5/10/16 Date Aftermath: Life Debt (Novel) to July 12 was (July 19). 05/08/2016 5/8/16 Date Obi-Wan & Anakin #5 to May 25 was (May 18). 05/03/2016 5/3/16 Short Story ??? (Insider #167) on July 26. 05/03/2016 5/3/16 Date Han Solo #1 to June 15 (was June 1). 04/29/2016 4/29/16 Cover Complete Locations (Reference) cover art. 04/29/2016 4/29/16 Date Complete Locations (Reference) to Sept. 27 (was Oct. 4). 04/28/2016 4/28/16 Date The Dark (YA Book) to June 30 (was Apr. 28). 04/28/2016 4/28/16 Date The Steal (YA Book) to June 30 (was Apr. 28). 04/27/2016 4/27/16 Date Scorched (Insider #165) (Short Story) to May 3 (was Apr. 26). 04/27/2016 4/27/16 Date Star Wars #19 to May 25 (was May 18). 04/19/2016 4/19/16 Date The Force Awakens #2 to July 27 (was ???). 04/19/2016 4/19/16 Date Star Wars #21 to July 20 (was ???). 04/19/2016 4/19/16 Date Darth Vader #23 to July 13 (was ???). 04/19/2016 4/19/16 Date Poe Dameron #4 to July 6 (was ???). 04/19/2016 4/19/16 Date Han Solo #2 to July 6 (was ???). 04/19/2016 4/19/16 Adaptation Rogue One on Mar. 28 at 192 pages. 04/19/2016 4/19/16 Info The Last Flight of the Harbinger (Comic) is the title of the story arc in Star Wars #21-?? (was The Last Flight of Harbinger). 04/18/2016 4/18/16 Story Arc Star Wars #21-?? will be called The Last Flight of Harbinger. 04/15/2016 4/15/16 Novelization Rogue One on Jan. 3 at 272 pages. 04/13/2016 4/13/16 Short Story Scorched is the title of Delilah S. Dawson's "Bloodline" tie-in short story in Insider #165 and is set in c. 27-28 ABY. 04/13/2016 4/13/16 Timeline Phantom Limb, The to c. 34 ABY (was c. 4-34 ABY) after "Before the Awakening". 04/10/2016 4/10/16 Date Join the Resistance #1 (YA Book) to Jan. 17 (was Oct. 25). 04/07/2016 4/7/16 YA Book ??? Adventures in Wild Space #6, a U.K. exclusive like the rest of the series, in Jan.
04/07/2016 4/7/16 YA Book ??? Adventures in Wild Space #5, a U.K. exclusive like the rest of the series, in Jan.
04/06/2016 4/6/16 Timeline Black Squadron to 34 ABY (was c. 34 ABY) after "Before the Awakening". 04/06/2016 4/6/16 Story Arc Poe Dameron #1-6 will be called Black Squadron. 03/31/2016 3/31/16 YA Book Ahsoka is the title of the Oct. 11 book by Emily Kate Johnston. Set in c. 19-4 BBY. 03/31/2016 3/31/16 Cover The Dark (YA Book) cover art. 03/31/2016 3/31/16 Cover The Steal (YA Book) cover art. 03/31/2016 3/31/16 Info The Dark (YA Book) is written by Tom Huddleston. 03/31/2016 3/31/16 Info The Steal (YA Book) is written by Cavan Scott. 03/28/2016 3/28/16 Date Darth Vader - Vol. 2 (Hardcover) to Feb. 20 (was Nov. 15). 03/26/2016 3/26/16 Non-Fiction The Art of Rogue One: A Star Wars Story on Dec. 16 at 256 pages. 03/25/2016 3/25/16 YA Book ??? (Rogue One Character Story) on Dec. 16 at 240 pages. 03/25/2016 3/25/16 YA Book ??? (Rogue One) on Dec. 16 at 336 pages. 03/25/2016 3/25/16 Trade Paperback Rogue One collecting the untitled Rogue One one-shot and 3-issue mini-series in Nov.
03/24/2016 3/24/16 Hardcover Trade The Force Awakens collecting The Force Awakens #1-5 on Dec. 6. 03/24/2016 3/24/16 Trade Paperback Poe Dameron - Vol. 1 collecting Poe Dameron #1-6 on Dec. 6. 03/23/2016 3/23/16 Hardcover Trade Kanan Omnibus (Hardcover) collecting Kanan #1-12 on Dec. 20. 03/22/2016 3/22/16 Info The Force Awakens (Paperback) will include "Bait", the short story from Insider #162, and "The Perfect Weapon" eNovella (first time in print). 03/22/2016 3/22/16 Date Aftermath: Empire's End to Jan. 17 (was ???). 03/22/2016 3/22/16 Date Darth Vader #22 to June 29 (was ???). 03/22/2016 3/22/16 Date The Force Awakens #1 to June 22 (was June ??). 03/22/2016 3/22/16 Date Star Wars #20 to June 15 (was ???). 03/22/2016 3/22/16 Date Poe Dameron #3 to June 8 (was ???). 03/22/2016 3/22/16 Date Darth Vader #21 to June 8 (was ???). 03/22/2016 3/22/16 Date Han Solo #1 to June 1 (was June ??). 03/21/2016 3/21/16 Hardcover Trade Darth Vader - Vol. 2 (Hardcover) collecting Vader Down #1 / Star Wars #13-14 / Darth Vader #13-15 / DV Annual #1 / Darth Vader #16-19 on Nov. 15. 03/21/2016 3/21/16 Info Kanan (Hardcover) is actually Darth Vader - Vol. 2 (Hardcover). I mistakenly jumped the gun based on page count and other evidence. 03/20/2016 3/20/16 Info Complete Locations (Reference) to 192 pages (was 152 pages). This now makes it larger than the Legends edition (176 pages) but it's still unknown how much material will stay in this edition and become canon. 03/20/2016 3/20/16 Reference Rogue One: Ultimate Visual Guide on Dec. 16 at 200 pages. 03/19/2016 3/19/16 Timeline Rogue One Mini-Series (Comic Mini-Series) is a prequel to the movie. 03/18/2016 3/18/16 Novel Catalyst on Oct. 4 w/ unannounced author. A prequel to Rogue One. 03/18/2016 3/18/16 Comic One-Shot ??? Rogue One related one-shot in Oct.
03/18/2016 3/18/16 Comic Mini-Series (3-parts) ??? Rogue One related mini in Oct.
03/14/2016 3/14/16 Hardcover Trade ??? (Hardcover) collecting Princess Leia #1-5, Lando #1-5, and Chewbacca #1-5 on Nov. 15. 03/14/2016 3/14/16 Trade Paperback Darth Vader - Vol. 4 collecting Darth Vader #20-25 on Nov. 1. 03/14/2016 3/14/16 Date Star Wars - Vol. 4 to Jan. 31 (was Nov. 15). 03/09/2016 3/9/16 Info Adventures in Wild Space (YA Book) U.S. readers can now order the U.K. exclusive prelude, The Escape, with FREE international shipping for a total of $3.52 on BookDepository.com. Get #1 The Snare and #2 The Nest at these links. 03/09/2016 3/9/16 Short Stories Tales From a Galaxy Far, Far Away: Vol. 1 - Aliens The two new short stories will be called "True Love" and "A Recipe for Death". 03/09/2016 3/9/16 Date C-3PO #1 to Apr. 13 (was Mar. 30). 03/07/2016 3/7/16 Info Ralph McQuarrie: Star Wars Art (Reference) is now only 2 volumes (was 3) but still has the same page count and number of illustrations. 03/07/2016 3/7/16 YA Book ??? on Oct. 11 by Emily Kate Johnston at 400 pages. 03/07/2016 3/7/16 Hardcover Trade Shattered Empire (Hardcover) collecting Shattered Empire #1-4 and the one-shot C-3PO #1 on Sept. 13. 03/03/2016 3/4/15 Info Insider #164 does NOT include a new short story despite solicitation saying "an all-new exclusive fiction". It's an excerpt from Battlefront: Twilight Company. Removed listing. 03/04/2016 3/4/16 Comic Mini-Series (5-parts) Han Solo in June. Written by Marjorie Liu and illustrated by Mark Brooks. Set in c. 3-4 ABY (between "The Empire Strikes Back" and "Return of the Jedi"). 02/29/2016 2/29/16 Trade Paperback Star Wars - Vol. 4 collecting Star Wars #21-?? on Nov. 15. 02/29/2016 2/29/16 Date Bloodline (Paperback) to Jan. 31, 2017 (was ???). 02/29/2016 2/29/16 Date The Force Awakens (Paperback) to Sept. 27 (was Nov. 1). 02/28/2016 2/28/16 Reference Complete Locations on Oct. 4. An updated edition of the Legends release (w/ only 152 pages vs. 176 in Legends). It's unknown how much material from the previous release will stay in this edition and become canon. 02/28/2016 2/28/16 YA Book Adventures in Wild Space #4 will be called The Dark. 02/28/2016 2/28/16 YA Book Adventures in Wild Space #3 will be called The Steal. 02/25/2016 2/25/16 Info Adventures in Wild Space (YA Books) U.S. fans listen up! Here is how you can order the U.K. exclusive series with FREE international shipping. The first two books, The Snare and The Nest, are available on BookDepository.com They don't have the prequel, The Escape, yet but it's not required reading in order to understand the rest of the series. There is NO information about a potential U.S. release so this may be the only way to get them. My order total for both books was only $14.99. 02/20/2016 2/20/16 Comic One-Shot Star Wars #20 will be the 3rd entry from Ben Kenobi's Journal. 02/16/2016 2/16/16 Story Arc Darth Vader #20-25 will be calld End of Games. 02/16/2016 2/16/16 Date Join the Resistance #1 (YA Book) to Oct. 25 (was Sept. 13). 02/16/2016 2/16/16 Info Rebel Jail (Story Arc) will only be 4 parts (Star Wars #16-19). 02/16/2016 2/16/16 Date Obi-Wan & Anakin #5 to May 18 (was ???). 02/16/2016 2/16/16 Date Star Wars #19 to May 18 (was ???). 02/16/2016 2/16/16 Date Darth Vader #20 to May 11 (was ???). 02/16/2016 2/16/16 Date Poe Dameron #2 to May 4 (was ???). 02/16/2016 2/16/16 Date Star Wars - Vol. 1 (Hardcover Trade) to Sept. 7 (was Sept. 20). 02/16/2016 2/16/16 Date Obi-Wan & Anakin #3 to Mar. 23 (was Mar. 9). 02/13/2016 2/13/16 Reference Galactic Atlas No U.S. release has been announced. 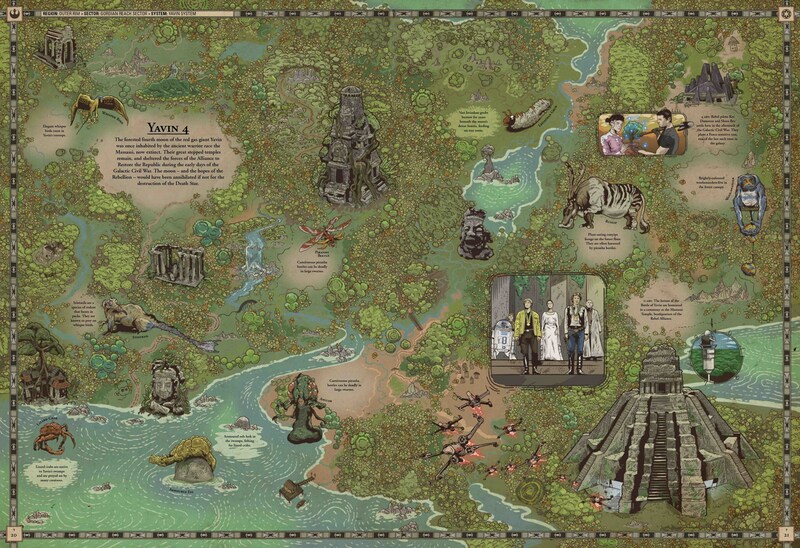 80 pages of illustrated maps covering all 7 movies, Rebels, The Clone Wars, novels, and comics. 02/13/2016 2/13/16 Young Adult Series Adventures in Wild Space I've delayed including this series (originally announced on Nov. 10) because there still isn't any mention of a U.S. release. With the U.K. release less than 2 weeks away, I've decided to add it with this note. 02/10/2016 2/10/16 Timeline Darth Vader: Annual #1 must be set between ''Vader'' and ''Shadows and Secrets'' according to the opening crawl of Darth Vader #16 (was between ''Vader Down'' and ''The Shu-Torun War''). 02/09/2016 2/9/16 Date Rebels: S2E19 - Twilight of the Apprentice: Pt II to Mar. 30 (was Q1). 02/09/2016 2/9/16 Date Rebels: S2E19 - Twilight of the Apprentice: Pt I to Mar. 30 (was Q1). 02/09/2016 2/9/16 Date Rebels: S2E18 - The Mystery of Chopper Base to Mar. 23 (was Q1). 02/09/2016 2/9/16 Date Rebels: S2E17 - The Forgotten Droid to Mar. 16 (was Q1). 02/09/2016 2/9/16 Date Rebels: S2E16 - Shroud of Darkness to Mar. 2 (was Q1). 02/04/2016 2/4/16 Cover Bloodline (Novel) cover art. 02/02/2016 2/2/16 Non-Fiction TOTTCS: Vol. 3 - Return of the Jedi on Aug. 16 by Gary Gerani. Collects all 220 Topps cards and 55 stickers from the 1983 series. 02/01/2016 2/1/16 Date Propaganda: A History of Persuasive Art in the Galaxy (Reference) to Oct. 25 (was Fall 2016). 02/01/2016 2/1/16 Info New Republic: Bloodline (Novel) retitled to simply Bloodline and may not be a part of a series after all. 02/01/2016 2/1/16 Info Dark Disciple (Paperback) will include "Kindred Spirits", the short story from Insider #159. 02/01/2016 2/1/16 Cover Character Encyclopedia - Updated & Expanded (Reference) cover art. 02/01/2016 2/1/16 Info Character Encyclopedia - Updated & Expanded (Reference) is written by Pablo Hidalgo and the Lucasfilm Story Group. 01/28/2016 1/28/16 Timeline Obi-Wan & Anakin to 29 BBY (was c. 28 BBY). 01/28/2016 1/28/16 Site News Heres a list of things Im catching up on and new features Im adding to improve the site. Check out the To-Do List and also submit your suggestions. 01/28/2016 1/28/16 Info Legacy of Lasan is retitled Legends of the Lasat. 01/20/2016 1/20/16 Comic One-Shot C-3PO #1 will be called Phantom Limb. 01/20/2016 1/20/16 Date Episode VIII (Movie) to Dec. 15, 2017 (was May 26, 2017). 01/20/2016 1/20/16 Date C-3PO #1 (Comic One-Shot) to Mar. 30 (was Mar. ??). 01/20/2016 1/20/16 Date Insider #165 (Short Story) to Apr. 26 (was ???). 01/19/2016 1/19/16 Young Adult Series Join the Resistance: Book #1 on Sept. 13 at 240 pages. 01/19/2016 1/19/16 Story Arc Darth Vader #16-19 will be calld The Shu-Torun War. 01/19/2016 1/19/16 Info Insider #163 does NOT include a new short story. It's an excerpt from The Perfect Weapon. Removed listing. 01/19/2016 1/19/16 Date Star Wars #18 to Apr. 27 (was ???). 01/19/2016 1/19/16 Date Obi-Wan & Anakin #4 to Apr. 20 (was ???). 01/19/2016 1/19/16 Date Darth Vader #19 to Apr. 13 (was ???). 01/19/2016 1/19/16 Date Poe Dameron #1 to Apr. 6 (was Apr. ??). 01/17/2016 1/17/16 Date C-3PO #1 (Comic One-Shot) to Mar. ?? (was Feb. 24). 01/14/2016 1/14/16 Comic Series Poe Dameron ongoing series in April. 01/13/2016 1/13/16 Date Rebels: S2E15 - The Honorable Ones to Feb. 24 (was ???). 01/13/2016 1/13/16 Date Rebels: S2E14 - Homecoming to Feb. 17 (was ???). 01/13/2016 1/13/16 Date Rebels: S2E13 - The Call to Feb. 10 (was ???). 01/13/2016 1/13/16 Date Rebels: S2E12 - Legacy of Lasan to Feb. 3 (was ???). 01/11/2016 1/11/16 Timeline Rebels: S2 some time before S2E10 - A Princess on Lothal the year changed to 3 BBY (was 4 BBY). 01/10/2016 1/10/16 Date Rebels: S2E11 - The Protector of Concord Dawn to Jan. 27 (was ???). 01/07/2016 1/07/16 Date Rebels: S2E10 - A Princess on Lothal to Jan. 20 (was ???). 01/07/2016 1/07/16 Info Tales From a Galaxy Far, Far Away: Aliens (YA Book) is retitled Tales From a Galaxy Far, Far Away - Vol. 1: Aliens. 01/07/2016 1/07/16 Cover Tales From a Galaxy Far, Far Away: Aliens (YA Book) cover art. 01/04/2016 1/04/16 Info Lords of the Sith (Paperback) will include "Orientation", the short story from Insider #157. 01/01/2016 1/01/16 Date Darth Vader #15 to Jan. 6 (was Jan. 13). 01/01/2016 1/01/16 Date Obi-Wan & Anakin #1 is available everywhere today! Marvel decided to let all comic shops sell the title 5 days early due to the post below. Digital copies are also available now. 12/30/2015 12/30/15 Story Arc Obi-Wan & Anakin mini-series is simply titled Obi-Wan and Anakin. 12/30/2015 12/30/15 Date Obi-Wan & Anakin #1 was shipped to comic stores early but retailers are being asked to wait until next week's official release date before putting them on shelves. However, SOME stores, like my LCS, have them on sale now! 12/23/2015 12/23/15 Date Insider #164 (Short Story) to Mar. 16 (was ???). 12/23/2015 12/23/15 Cover Insider #165 (Short Story) cover art. 12/22/2015 12/22/15 Date Kanan - Vol. 2: First Blood (TPB) to May 31 (was May 3). 12/20/2015 12/20/15 Adaptation The Force Awakens - A Junior Novel is the full title of the junior novelization. 12/20/2015 12/20/15 Hardcover Trade Star Wars - Vol. 1 (Hardcover) collecting Star Wars #1-12 on Sept. 20. 12/20/2015 12/20/15 Cover The Force Awakens - A Junior Novel (Adaptation) cover art. 12/20/2015 12/20/15 Cover Bait (Insider #162) (Short Story) cover art. 12/17/2015 12/17/15 Date New Republic: Bloodline (Novel) to May 3 (was Mar. 29). 12/17/2015 12/17/15 Date Aftermath: Life Debt (Novel) to July 19 (was May 31). 12/15/2015 12/15/15 Info Kanan (Comic Series) to end with issue #12. 12/15/2015 12/15/15 Site News Profile Pages have been added for novels, YA books, and short stories. Click on a story's title in any of the timelines to see more info such as previews, trivia, and reviews from dozens of fansites. Some are still a work in progress and more are coming by the end of the year. 12/15/2015 12/15/15 Date Obi-Wan & Anakin #3 to Mar. 9 (was ???). 12/15/2015 12/15/15 Timeline Kanan #12 to c. 19 BBY (was ???). 12/15/2015 12/15/15 Date Kanan #12 to Mar. 16 (was ???). 12/15/2015 12/15/15 Date Darth Vader #18 to Mar. 30 (was ???). 12/15/2015 12/15/15 Date Star Wars #17 to Mar. 23 (was ???). 12/15/2015 12/15/15 Date Darth Vader #17 to Mar. 2 (was Feb. 10). 12/13/2015 12/13/15 Reference On the Front Lines: Notes on Tactics, Armor and Valor from Galactic Conflicts in Fall 2016 by Daniel Wallace at 128 pages. 12/13/2015 12/13/15 Reference Propaganda: A History of Persuasive Art in the Galaxy in Fall 2016 by Pablo Hidalgo at 112 pages. Collects in-universe artwork history. 12/11/2015 12/11/15 Trade Paperback Darth Vader - Vol. 3 collecting Darth Vader #16-19 and DV Annual #1 on Aug. 9. 12/11/2015 12/11/15 Timeline Haunt (Kanan #6) to c. 4 BBY (was c. 5-4 BBY) according to the opening crawl of Kanan #9. 12/10/2015 12/10/15 Comic Annual Darth Vader: Annual #1 story is simply titled "Darth Vader: Annual". 12/05/2015 12/05/15 Date The Force Awakens (Paperback) to Nov. 1 (was ???). 12/04/2015 12/04/15 Info The episode listed as Rebels: S2E10 - The Secret of Prisoner X10 on Dec. 12 is incorrect info. That title is actually the original production title of Rebels: S2E09 - Legacy. There is currently no date or title for Rebels: S2E10. 12/03/2015 12/03/15 Trade Paperback Obi-Wan & Anakin collecting all 5 issues of the mini-series on July 19. 12/03/2015 12/03/15 Comic Annual Star Wars: Annual #1 story is simply titled "Star Wars: Annual". 12/03/2015 12/03/15 Date Dark Disciple (Paperback) to Mar. 1 (was Mar. 29). 12/03/2015 12/03/15 Cover Aftermath: Life Debt (Novel) cover art. 12/02/2015 12/02/15 Trade Paperback Star Wars - Vol. 3 collecting Star Wars #15-20 on Aug. 16. 12/02/2015 12/02/15 Info Star Wars - Vol. 3 (TPB) is not "Vader Down" which is a separate TPB release on Apr. 19. Vol. 3 contains Star Wars #15-20 and is released on Aug. 16. 12/01/2015 12/01/15 Cover The Force Awakens: Incredible Cross-Sections (Reference) cover art. 11/30/2015 11/30/15 TV Season Star Wars: Rebels  Season 3 in Fall 2016. No word yet on episode count. 11/20/2015 11/20/15 Cover High Noon on Jakku (Short Story) cover art. 11/20/2015 11/20/15 Cover All Creatures Great and Small (Short Story) cover art. 11/20/2015 11/20/15 Cover The Face of Evil (Short Story) cover art. 11/20/2015 11/20/15 Cover The Crimson Corsair and the Lost Treasure of Count Dooku (Short Story) cover art. 11/18/2015 11/18/15 Comic Magazine Star Wars: Rebels  Magazine #3 on Feb. 17 will contain 2 comics. The panel on the cover isn't from any of the first 8 issues of the UK edition. 11/18/2015 11/18/15 Graphic Novel The Empire Strikes Back: Artist's Edition on Apr. 13. Collects all of Al Williamson's ESB art and other select Star Wars art. 11/18/2015 11/18/15 Date Insider #163 (Short Story) to Feb. 3 (was ???). 11/18/2015 11/18/15 Cover Insider #163 (Short Story) cover art. 11/18/2015 11/18/15 Date C-3PO #1 to Feb. 24 (was Dec. 23). 11/18/2015 11/18/15 Cover Kanan #9 and #10 swap covers. 11/17/2015 11/17/15 Story Arc Star Wars #16-?? will be called Rebel Jail. 11/17/2015 11/17/15 Date Star Wars #16 to Feb. 17 (was Feb. ???). 11/17/2015 11/17/15 Date Darth Vader #17 to Feb. 10 (was Feb. ???). 11/17/2015 11/17/15 Date Kanan #11 to Feb. 24 (was Feb. ???). 11/17/2015 11/17/15 Date Obi-Wan & Anakin #2 to Feb. 3 (was Feb. ???). 11/17/2015 11/17/15 Site News The site is fully functional again and better than ever! It even loads 0.6 seconds faster. Starting work on new features which will begin rolling out tomorrow. Send your suggestions to me on Facebook or @TMBGeeks. Thanks for the support! 11/16/2015 11/16/15 DVD/Blu-ray The Force Awakens is rumored to be released on Apr. 5 due to several book release dates being moved to that date. 11/16/2015 11/16/15 Date Star Wars: Artifact Edition Presumed to have been canceled after missing it's release date, this title is now confirmed for Dec. 9 (was Oct. 28). 11/16/2015 11/16/15 Date Tales From a Galaxy Far, Far Away: Aliens (YA Book) to Apr. 5 (was Apr. 26). 11/13/2015 11/13/15 Cover The Force Awakens (Novel) cover art. 11/09/2015 11/09/15 Cover Inbrief (Insider #161) (Short Story) cover art updated. 11/08/2015 11/08/15 Cover Star Wars: The Original Trilogy (Graphic Novel) cover art. 11/07/2015 11/07/15 Date Rebels: S2E10 - The Secret of Prisoner X10 to Dec. 12 (was S2E09 on Dec. 9). 11/07/2015 11/07/15 Date Rebels: S2E09 - Legacy to Dec. 9. 11/07/2015 11/07/15 Info Rebels: S2E08 - The Future of the Force (was The Lost Children). 11/05/2015 11/05/15 Date Darth Vader #16 to Feb. 10 (was Jan. 27). 11/05/2015 11/05/15 Date Kanan #10 to Jan. 27 (was Jan. 13). 11/03/2015 11/03/15 Date C-3PO #1 to Dec. 23 (was Dec. 2). 11/02/2015 11/2/15 Trade Paperback Kanan - Vol. 2: First Blood collecting the Kanan #7-11 arc and #12, which will likely be a one-shot, on May 3. 10/28/2015 10/28/15 Timeline First Blood to c. 19 BBY (was c. 19+ BBY). 10/28/2015 10/28/15 Date The Making of Star Wars: The Force Awakens (Non-Fiction) to Oct. 25, 2016 (was Mar. 15). 10/22/2015 10/22/15 Date Inbrief (Insider #161) (Short Story) to Nov. 5 (was Oct. 20). 10/20/2015 10/20/15 Date Darth Vader #16 to Jan. 27 (was Jan. ??). 10/20/2015 10/20/15 Date Star Wars #15 to Jan. 20 (was Jan. ??). 10/20/2015 10/20/15 Date Darth Vader #15 to Jan. 13 (was Jan. ??). 10/20/2015 10/20/15 Date Kanan #10 to Jan. 13 (was Jan. ??). 10/20/2015 10/20/15 Date Obi-Wan & Anakin #1 to Jan. 6 (was Jan. ??). 10/20/2015 10/20/15 Date Star Wars #14 to Jan. 6 (was Dec. 30). 10/20/2015 10/20/15 Date Chewbacca #5 to Dec. 30 (was Dec. 23). 10/20/2015 10/20/15 Date Darth Vader #14 to Dec. 23 (was Dec. 16). 10/20/2015 10/20/15 Date Star Wars #13 to Dec. 2 (was Nov. 25). 10/20/2015 10/20/15 Date Chewbacca (TPB) to Feb. 23 (was Feb. 16). 10/18/2015 10/18/15 Poster Episode VII: The Force Awakens (Movie) poster art. 10/14/2015 10/14/15 Story Arc Chewbacca mini-series is simply titled Chewbacca. 10/13/2015 10/13/15 Short Story Inbrief is the title of Janine K. Spendlove's Battlefront: Twilight company tie-in short story in Insider #161. 10/12/2015 10/12/15 Date Rebels: S2E09 - The Secret of Prisoner X10 to Dec. 9. 10/12/2015 10/12/15 Date Rebels: S2E08 - The Lost Children to Dec. 2. 10/12/2015 10/12/15 Date Rebels: S2E07 - Stealth Strike to Nov. 25. 10/12/2015 10/12/15 Cover The Perfect Weapon (eNovella) cover art. 10/11/2015 10/11/15 Site News Yesterday, all sources misreported the audio from the NYCC panel's info on Landry Walker's 4 short stories. All correct info has been updated on this site. 10/11/2015 10/11/15 Info Bait is the title of Alan Dean Foster's short story in Insider #162. 10/11/2015 10/11/15 Date The Perfect Weapon will be released on Nov. 24 (was Nov. ??). 10/10/2015 10/10/15 eNovellas Tales From a Galaxy Far, Far Away: Aliens On Dec. 1, four of the six short stories in this Apr. 26 book by Landry Walker will be released as eNovellas: "High Noon on Jakku", "All Creatures Great and Small", "The Face of Evil", "The Crimson Corsair and The Lost Treasure of Count Dooku". 10/10/2015 10/10/15 Short Story ??? (Insider #162) on Dec. 22 by Alan Dean Foster. 10/10/2015 10/10/15 eNovella The Perfect Weapon on Nov. 24 by Delilah S. Dawson. 10/10/2015 10/10/15 Comic Mini-Series (5-parts) Obi-Wan & Anakin in Jan. Written by Charles Soule and illustrated by Marco Checchetto. Set in c. 28 BBY. 10/10/2015 10/10/15 Novel New Republic: Bloodline is the title of the Mar. 29 novel by Claudia Gray. Set 6 years before Episode VII: The Force Awakens (c. 28 ABY). 10/10/2015 10/10/15 Novel Aftermath: Empire's End is the title of the last book in the trilogy to be released in 2017 by Chuck Wendig. 10/10/2015 10/10/15 Novel Aftermath: Life Debt is the title of the May 31 novel (was June 14) and the second book in the trilogy by Chuck Wendig. 10/09/2015 10/09/15 Date Ralph McQuarrie: Star Wars Art to Sept. 6 (was Apr. 16). 10/08/2015 10/08/15 Date Rebels: S2E06 - Blood Sisters to Nov. 18. 10/08/2015 10/08/15 Date Rebels: S2E05 - Wings of the Master to Nov. 11. 10/08/2015 10/08/15 Date Rebels: S2E04 - Brothers of the Broken Horn to Nov. 4. 10/05/2015 10/05/15 Info Creatures of the Outer Rim (YA Book) is retitled Tales from a Galaxy Far, Far Away. 10/02/2015 10/02/15 Timeline Battlefront: Twilight Company to 3 ABY (was c. 1.5 ABY). 10/02/2015 10/02/15 Date Rebels: S2E03 - Always Two There Are to Oct. 28. 10/02/2015 10/02/15 Date Rebels: S2E02 - Relics of the Old Republic to Oct. 21. 09/30/2015 9/30/15 Date Star Wars #11 to Nov. 4 (was Oct. 28). 09/25/2015 9/25/15 YA Book Before the Awakening is the title of the Dec. 18 character novel starring Poe, Rey, and Finn. Greg Rucka writes this book set pre-TFA. 09/25/2015 9/25/15 Cover Before the Awakening (YA Book) cover art. 09/25/2015 9/25/15 Cover The Force Awakens: Visual Dictionary (Reference) cover art. 09/22/2015 9/22/15 Trade Paperback Star Wars - Vol. 3: Vader Down collecting Vader Down #1, Star Wars #13-14, and Darth Vader #13-15 on Apr. 19. 09/21/2015 9/21/15 Cover TOTTCS: Star Wars Galaxy (Non-Fiction) changed to all new cover art. 09/17/2015 9/17/15 Novel Untitled Del Rey Novel (ISBN: 978-1-101-96693-8) on June 14, 2016. No other info is known. The timing suggests it could be the second Aftermath book. 09/15/2015 9/15/15 Comic Magazine Star Wars: Rebels - Magazine on Nov. 11. The U.K. magazine that features a 12-page Rebels comic in each issue is coming to the U.S. but may skip every other issue of the U.K. edition. Issues #1 and #2 have been announced but the U.S. #2 appears to be the contents of the U.K.s #3. 09/15/2015 9/15/15 Comic Annual Darth Vader: Annual #1 on Dec. 16. 09/15/2015 9/15/15 Comic Annual Star Wars: Annual #1 on Dec. 9. 09/15/2015 9/15/15 Info Creatures of the Outer Rim moved back to YA Book as originally listed (was moved to Reference in July). 09/15/2015 9/15/15 Date C-3PO #1 to Dec. 2 (was Dec. ???). 09/15/2015 9/15/15 Date Chewbacca #5 to Dec. 23 (was Dec. 9). 09/15/2015 9/15/15 Date Kanan #9 to Dec. 16 (was Dec. ???). 09/15/2015 9/15/15 Date Darth Vader #14 to Dec. 16 (was Dec. ???). 09/15/2015 9/15/15 Date Star Wars #14 to Dec. 30 (was Dec. ???). 09/11/2015 9/11/15 Cover The Art of Star Wars: The Force Awakens (Non-Fiction) cover art. 09/11/2015 9/11/15 Info The Art of Star Wars: The Force Awakens (Non-Fiction) to 256 pages (was ???). 09/10/2015 9/10/15 Story Arc Kanan #6 will be called Haunt. 09/09/2015 9/09/15 Story Arc Shattered Empire mini-series is simply titled Shattered Empire. 09/04/2015 9/04/15 Timeline C-3PO #1 to c. 4-34 ABY (was ???). 09/04/2015 9/04/15 Date C-3PO #1 to Dec. (was ??? 2015). 09/04/2015 9/04/15 Info C-3PO #1 is written by James Robinson and illustrated by Tony Harris. 09/04/2015 9/04/15 Info Untitled The Force Awakens: Junior Novelization is written by Michael Kogge. 09/03/2015 9/03/15 Date Vader Down to Nov. 18 (was Nov. 11). 09/03/2015 9/03/15 Date Darth Vader #13 to Nov. 25 (was Nov. 18). 09/03/2015 9/03/15 Date Darth Vader #12 to Nov. 11 (was Nov. 4). 09/03/2015 9/03/15 Date Star Wars #12 to Nov. 18 (was Nov. 11). 09/03/2015 9/03/15 Date Star Wars #11 to Oct. 28 (was Oct. 21). 08/28/2015 8/28/15 Date Rebels: S2E01 - The Lost Commanders to Oct. 14 (was Fall 2015). 08/28/2015 8/28/15 Cover Battlefront: Twilight Company (Novel) cover art. 08/27/2015 8/27/15 Info Rebels: Epic Battles (Reference) is written by Adam Bray (was ???). 08/25/2015 8/25/15 Cover Rebels: Epic Battles (Reference) cover art. 08/19/2015 8/19/15 Date Insider #161 (Short Story) to Oct. 20 (was ???). 08/19/2015 8/19/15 Cover Insider #161 (Short Story) cover art. 08/19/2015 8/19/15 Info The Force Awakens: Visual Dictionary (Reference) to 80 pages (was 96 pages). 08/19/2015 8/19/15 Date Chewbacca (TPB) to Feb. 16 (was Feb. 2). 08/19/2015 8/19/15 Date Showdown on the Smugglers' Moon (TPB) to Jan. 26 (was Jan. 5). 08/18/2015 8/18/15 Short Story Story in Insider #160 is titled Blade Squadron: Zero Hour. 08/15/2015 8/15/15 Info Episode IX (Movie) to be directed by Colin Trevorrow. 08/15/2015 8/15/15 Info The Making of Star Wars: The Force Awakens (Non-Fiction) to be written by Mark Cotta Vaz. 08/14/2015 8/14/15 Non-Fiction The Making of Star Wars: The Force Awakens on Mar. 15, 2016 w/ 376 pages. 08/14/2015 8/14/15 Reference Star Wars Character Encyclopedia - Updated and Expanded on Apr. 5, 2016. An updated edition of the Legends release w/ 16 new pages (224 pages total) of The Force Awakens material. 08/13/2015 8/13/15 Non-Fiction TOTTCS: Star Wars Galaxy on Mar. 15, 2016 by Gary Gerani and Drew Struzan. Collects all of the "New Vision" Topps card series. 08/13/2015 8/13/15 Non-Fiction TOTTCS: Vol. 2 - The Empire Strikes Back on Apr. 19, 2016 by Gary Gerani. Collects all 353 Topps cards and 88 stickers from the 1980 series. 08/13/2015 8/13/15 Date Shattered Empire #1 to Sept. 9 (was Sept. 2). 08/13/2015 8/13/15 Date Ralph McQuarrie: Star Wars Art (Non-Fiction) to Apr. 15 (was Fall 2016). 08/13/2015 8/13/15 Info Ralph McQuarrie: Star Wars Art (Non-Fiction) to 768 pages (was ???) in three hardcover volumes w/ 1,500 illustrations. 08/13/2015 8/13/15 Cover Ralph McQuarrie: Star Wars Art (Non-Fiction) cover art. 08/11/2015 8/11/15 Timeline Mercy Mission to 14 BBY (was c. 19-11 BBY) between Lords of the Sith and Tarkin. 08/10/2015 8/10/15 Short Story Mercy Mission by Melissa Scott in The Rise of the Empire. Featuring a young Hera sometime between 19-11 BBY. 08/10/2015 8/10/15 Short Story Bottleeck by John Jackson Miller in The Rise of the Empire. Featuring a tense alliance with Tarkin and Count Vidian sometime between 14-11 BBY. 08/10/2015 8/10/15 Short Story The Levers of Power by Jason Fry in The Rise of the Empire. Featuring Rae Sloane commanding the Vigilance during the Battle of Endor in 4 ABY. 08/06/2015 8/06/15 Date Original Topps Trading Card Series: Vol. 1 (Reference) to Nov. 17 (was Aug. 18). 08/06/2015 8/06/15 Date Creatures of the Outer Rim (Reference) to Apr. 26 (was Mar. 1). 08/05/2015 8/05/15 Date Shattered Empire #3 to Oct. 14 (was Oct. 7). 08/05/2015 8/05/15 Date Shattered Empire #2 to Oct. 7 (was Sept. 16). 08/04/2015 8/04/15 Info Showdown on Smuggler's Moon (TPB) adjusted to Showdown on the Smugglers' Moon. 08/02/2015 8/02/15 Info Rebels: The Epic Battle (Reference) is retitled Rebels: Epic Battles. 07/31/2015 7/31/15 Cover Chewbacca (TPB) cover art. 07/31/2015 7/31/15 Cover Lando (TPB) cover art. 07/31/2015 7/31/15 Cover Shadows and Secrets (TPB) cover art. 07/31/2015 7/31/15 Cover Showdown on Smuggler's Moon (TPB) cover art. 07/30/2015 7/30/15 Timeline Star Wars #7 to c. 11 BBY (was 5 BBY) according to editor Jordan D. White in reply to our tweets for confirmation. The original source was wrong. 07/29/2015 7/29/15 Story Arc Kanan #7-11 will be called First Blood. 07/29/2015 7/29/15 Timeline Kanan #8-11 to 19+ BBY (was ???). 07/27/2015 7/27/15 Story Arc Darth Vader #13 will be called Vader Down (Pt. 2 of 6). 07/27/2015 7/27/15 Story Arc Vader Down will be called Vader Down (Pt. 1 of 1) despite continuing in Darth Vader #13 as "Vader Down (Pt. 2 of 6)". 07/27/2015 7/27/15 Date Added tentative release months for Star Wars #15-18 through Apr., Darth Vader #16-18 through May, and Chewbacca #4-5 through Jan.
07/27/2015 7/27/15 Timeline Darth Vader #13 to c. 0-1 ABY (was ???). 07/26/2015 7/26/15 Canceled All remaining Rebels S2 Adaptations. 07/25/2015 7/25/15 Date Lando #5 to Oct. 7 (was Sept. 30). 07/23/2015 7/23/15 Comic One-Shot Last of His Breed, The is assumed to be the title of Star Wars #7, the Ben Kenobi one-shot. Based on it being in quotes in the opening crawl and there's no comma preceding it so it isn't just a description. 07/19/2015 7/19/15 Timeline Imperial Justice to 4 ABY (was ??? BBY) during SW: Rebels S1. 07/17/2015 7/17/15 Reference Creatures of the Outer Rim , the previously untitled "Alien Book" that was listed as a YA Book is actually a Reference book. 07/17/2015 7/17/15 Info Creatures of the Outer Rim moved from YA Book to Reference. 07/17/2015 7/17/15 Timeline Shattered Empire to 4 ABY (was c. 4-33 ABY) between Return of the Jedi and Aftermath. 07/17/2015 7/17/15 Timeline The Weapon of a Jedi to 0 ABY (was c. 0-3 ABY) between Heir to the Jedi and Skywalker Strikes. 07/17/2015 7/17/15 Timeline Smuggler's Run to 0 ABY (was c. 0-3 ABY) parallel w/ Princess Leia. 07/17/2015 7/17/15 Timeline Lost Stars to 0-5 ABY (was c. 0-4 ABY). Prologue/Ch. 1~ set 11 BBY. 07/16/2015 7/16/15 Timeline Aftermath to 4 ABY (was c. 4-33 ABY). 07/15/2015 7/15/15 Canceled Untitled Rebels adaptation of The Siege of Lothal. 07/14/2015 7/14/15 Timeline Kanan #7 to 19+ BBY. 07/14/2015 7/14/15 Date Chewbacca #1 (10/14) & #2 (10/28). 07/14/2015 7/14/15 Info Kanan - Vol. 1 (TPB) to 136 pages (was 112 pages). 07/11/2015 7/11/15 Comic One-Shot Vader Down in Nov. leading in to crossovers with Star Wars and Darth Vader, presumably in issues #13 (new arc) for both series. Written by Jason Aaron and Kieron GIllen and drawn by Mike Deodato and Salvador Larroca. 07/11/2015 7/11/15 Timeline Vader Down to c. 0-1 ABY after Shadows and Secrets and before Twilight Company since Aphra is still around. 07/10/2015 7/10/15 Comic Mini-Series (5-parts) Chewbacca in Oct. written by Gary Dugan and illustrated by Phil Noto. Set some time after Episode IV. 07/10/2015 7/10/15 Timeline Moving Target to c. 3-4 ABY between Episode V and Episode VI. 07/10/2015 7/10/15 Cover Moving Target (YA Book) final art. 07/10/2015 7/10/15 Cover Smuggler's Run (YA Book) final art. 07/10/2015 7/10/15 Cover The Weapon of a Jedi (YA Book) final art. 07/10/2015 7/10/15 Cover Lost Stars (YA Book) final art. 07/08/2015 7/08/15 Story Arc Lando mini-series is simply titled Lando. 07/06/2015 7/06/15 Story Arc Star Wars #8-12 will be called Showdown on Smuggler's Moon. 06/25/2015 6/25/15 Story Arc Darth Vader #7-12 is called Shadows and Secrets. 07/11/2015 7/11/15 Site News They Might Be Geeks launched. 4/06/17 4/6/17 Short Story Anthology Operation: Blue Milk in ??? 2017 by dozens of authors to be announced. Short stories are new. 3/21/17 3/21/17 Comic One-Shot Droids Unplugged #1 on June 28 collecting the three bonus comics "SaBBotage", "Droid Dilemma", and "Probe Droid Problem" originally published in Poe Dameron #1, Star Wars #25, and Darth Maul #1. 3/10/17 3/10/17 Comic Series Darth Vader: Dark Lord of the Sith ongoing series in June written by Charles Soule and illustrated by Guiseppe Camuncoli. Set in 19 BBY "one second" after Revenge of the Sith. 3/06/17 3/6/17 Trade Paperback Darth Maul: Son of Dathomir collects Darth Maul: Son of Dathomir #1-4 on Nov. 21. 3/06/17 3/6/17 Trade Paperback Poe Dameron - Vol. 3 collecting Poe Dameron #14-19 on Oct. 31. 2/22/17 2/22/17 Digital HD Rogue One to Mar. 24. 2/22/17 2/22/17 DVD/Blu-ray Rogue One to Apr. 4 (was May 2). 2/21/17 2/21/17 Story Arc ??? spans Poe Dameron #14-19. 2/21/17 2/21/17 Hardcover Trade Darth Vader Omnibus collects Darth Vader #1-25 / Annual #1 / Vader Down #1 / Star Wars #13-14 on Sept. 6. 2/20/17 2/20/17 Non-Fiction Making Rogue One by Josh Kushins on Oct. 3. 2/20/17 2/20/17 Trade Paperback Rogue One collecting Rogue One #1-6 on Dec. 5. 2/20/17 2/20/17 Trade Paperback Force Awakens, The collecting The Force Awakens #1-6 on Nov. 21. 2/20/17 2/20/17 Trade Paperback Screaming Citadel collects Screaming Citadel #1 / Star Wars #31-31 / Doctor Aphra #7-8 on Oct. 24. 2/20/17 2/20/17 Trade Paperback Darth Maul collects Darth Maul #1-5 on Sept. 5. 2/17/17 2/17/17 Novel Inferno Squad on July 25 by Christie Golden. Set in c. 0-1 ABY. 2/12/17 2/12/17 Reference Absolutely Everything You Need to Know - Updated and Expanded on Nov. 7. An updated edition of the canon release (w/ 256 pages vs. 200 in previous edition). 2/08/17 2/8/17 Comic One-Shot Screaming Citadel in May leading in to crossovers with Star Wars and Doctor Aphra in issues #31-32 and #7-8 respectively. Written by Kieron GIllen and drawn by Marco Checchetto. 1/23/17 1/23/17 Movie The Last Jedi is the title of Episode VIII. 1/12/17 1/12/17 Comic Adaptation (6-parts) Rogue One in Apr. will be written by Jody Houser and illustrated by Emilio Laiso. 12/07/16 12/7/16 Story Arc Aphra is the title of the story arc in Doctor Aphra #1-?? (was ???). 11/30/16 11/30/16 Comic Annual Star Wars: Annual #2 story is confirmed to be simply titled "Annual #2" (was Annual #2). 11/25/16 11/25/16 Story Arc Yoda's Secret War is the title of the story arc in Star Wars #26-31 (was Ben Kenobi Journal #4). 11/23/16 11/23/16 Comic Backup Story Droid Dilemma is the title of the Star Wars #25 R2-D2 backup story. 11/14/16 11/14/16 Comic Mini-Series (5-parts) Darth Maul in Feb. written by Cullen Bunn and illustrated by Luke Ross. Set in c. 54-32 BBY. 11/05/16 11/5/16 Comic Backup Story ??? in Doctor Aphra #1 will be 10 pages and drawn by Salvador Larroca. 11/03/16 11/3/16 Story Arc Poe Dameron #8-10 is called The Gathering Storm (Book III) and is not to be confused with the one-shot Poe Dameron #7 that is also called "The Gathering Storm" but is not labeled as "Book III". 11/03/16 11/3/16 YA Book The Rescue is the title of Adventures in Wild Space #6. 11/01/16 11/1/16 Trade Paperback Star Wars - Vol. 5 collecting Star Wars #26-31 on July 18. 10/25/16 10/25/16 Story Arc ??? spans Poe Dameron #11-13. 10/25/16 10/25/16 Trade Paperback Poe Dameron - Vol. 2 collecting Poe Dameron #7-13 on June 20. 10/25/16 10/25/16 Hardcover Trade Star Wars - Vol. 2 (Hardcover) collecting Star Wars #15-25 and SW Annual #2 on June 20. 10/20/16 10/20/16 Comic One-Shot Gathering Storm, The is the title of the one-shot story in Poe Dameron #7. 10/18/16 10/18/16 Trade Paperback Doctor Aphra collecting Doctor Aphra #1-6 on July 4. 10/12/16 10/12/16 Comic Series Doctor Aphra is the title of the Cassified ongoing series. 10/12/16 10/12/16 Comic Backup Story Darth Vader - Book IV: Coda is the title of the Darth Vader #25 backup story. 9/19/16 9/19/16 Comic Series ??? ongoing series in December. 9/19/16 9/19/16 YA Book The Cold is the title of Adventures in Wild Space #5. 9/16/16 9/16/16 Story Arc Ben Kenobi Journal #4 in Star Wars #26-?? is set in c. 44-32 BBY. 8/23/16 8/23/16 Comic Annual Star Wars: Annual #2 on Nov. 30 set in c. 0-4 ABY. 8/23/16 8/23/16 Comic Backup Story R2-D2 in Star Wars #25 will be 8 pages written and drawn by Chris Eliopoulos. 8/18/16 8/18/16 TV Season Star Wars Rebels: Season 4 in Fall 2017. No word yet on episode count. 8/15/16 8/15/16 Story Arc ??? spans Poe Dameron #8-10. 8/15/16 8/15/16 Comic One-Shot ??? in Poe Dameron #7. 8/09/16 8/9/16 DVD/Blu-ray Rogue One is rumored to be released on May 2 due to several book release dates being moved to that date. 8/05/16 8/5/16 Reference Star Wars: Visual Encyclopedia on Apr. 4, 2017 by Adam Bray at 360 pages. 7/26/16 7/26/16 YA Book Adventures in Wild Space #4: The Darkness to be published in the U.S. on Aug. ? ?, 2017. The original U.K. title was "The Dark". 7/19/16 7/19/16 Graphic Novel Star Wars: The Prequel Trilogy on ???. 7/19/16 7/19/16 Graphic Novel The Force Awakens: The Story of the Movie in Comics on Oct. 17 at 76 pages and written by Alessandro Ferrari and art by Alessandro Pastrovicchio. 7/06/16 7/16/16 Novel Thrawn on Apr. 11 by Timothy Zahn. 7/06/16 7/16/16 Comic Backup Story ??? in Darth Vader #25 will be 10 pages and drawn by Max Fiumara. Set during Darth Vader #1. 7/06/16 7/16/16 Short Story Blade Squadron: Jakku (Insider #171) on Jan.-Feb. ?? by Mark Williams and David Williams. A tie-in to Aftermath: Empire's End set in c. 4-5 ABY. 7/06/16 7/16/16 Short Story Voices of the Empire (Insider #170) on Dec. ?? by Mur Lafferty. A tie-in to Rogue One set in c. 1-0 BBY. 7/06/16 7/16/16 Short Story Turning Point (Insider #169) on Oct. ?? by Jason Hough and set "just after Return of the Jedi" in 4 ABY. 7/06/16 7/16/16 Short Story Blade Squadron: Kuat (Insider #168) on Sept. ?? by Mark Williams and David Williams. A tie-in to Aftermath: Life Debt set in c. 4-5 ABY. 7/06/16 7/6/16 Story Arc Poe Dameron #4-6 is called Lockdown. 7/05/16 7/5/16 Reference Galactic Maps is also getting a U.S. release on Dec. 20 (known as Galactic Atlas in the U.K.). 6/28/16 6/28/16 YA Book Adventures in Wild Space #3: The Heist to be published in the U.S. on Apr. 11. The original U.K. title was "The Steal". 6/27/16 6/27/16 YA Book Adventures in Wild Space: The Escape prelude to the series to be included in the U.S. release of "The Snare" on Nov. 15. 6/25/16 6/25/16 YA Book Adventures in Wild Space #2: The Nest to be published in the U.S. on Nov. 15. 6/25/16 6/25/16 YA Book Adventures in Wild Space #1: The Snare to be published in the U.S. on Nov. 15. 6/25/16 6/25/16 Young Adult Series Adventures in Wild Space "6 book series" to be published in the U.S. beginning on Nov. 15. Formerly a U.K. exclusive. No word on the shorter and non-essential prequel, The Escape. 6/16/16 6/16/16 Story Arc The Force Awakens mini-series is simply titled The Force Awakens. 6/13/16 6/13/16 Trade Paperback Han Solo collecting Han Solo #1-5 on Jan. 3. 6/09/16 6/9/16 Story Arc Han Solo mini-series is simply titled Han Solo. 5/27/16 5/27/16 Short Story TK-146275 (Insider #166) on June 7 by Sylvain Neuvel. 5/16/16 5/16/16 Adaptation Finn's Story on Sept. 13. Retells "The Force Awakens" from Finn's perspective. 5/03/16 5/3/16 Short Story ??? (Insider #167) on July 26. 4/19/16 4/19/16 Adaptation Rogue One on Mar. 28 at 192 pages. 4/18/16 4/18/16 Story Arc Star Wars #21-?? will be called The Last Flight of Harbinger. 4/15/16 4/15/16 Novelization Rogue One on Jan. 3 at 272 pages. 4/13/16 4/13/16 Short Story Scorched is the title of Delilah S. Dawson's "Bloodline" tie-in short story in Insider #165 and is set in c. 27-28 ABY. 4/07/16 4/7/16 YA Book ??? Adventures in Wild Space #6, a U.K. exclusive like the rest of the series, in Jan.
4/07/16 4/7/16 YA Book ??? Adventures in Wild Space #5, a U.K. exclusive like the rest of the series, in Jan.
4/06/16 4/6/16 Story Arc Poe Dameron #1-6 will be called Black Squadron. 3/31/16 3/31/16 YA Book Ahsoka is the title of the Oct. 11 book by Emily Kate Johnston. Set in c. 19-4 BBY. 3/26/16 3/26/16 Non-Fiction The Art of Rogue One: A Star Wars Story on Dec. 16 at 256 pages. 3/25/16 3/25/16 YA Book ??? (Rogue One Character Story) on Dec. 16 at 240 pages. 3/25/16 3/25/16 YA Book ??? (Rogue One) on Dec. 16 at 336 pages. 3/25/16 3/25/16 Trade Paperback Rogue One collecting the untitled Rogue One one-shot and 3-issue mini-series in Nov.
3/24/16 3/24/16 Hardcover Trade The Force Awakens collecting The Force Awakens #1-5 on Dec. 6. 3/24/16 3/24/16 Trade Paperback Poe Dameron - Vol. 1 collecting Poe Dameron #1-6 on Dec. 6. 3/23/16 3/23/16 Hardcover Trade Kanan Omnibus (Hardcover) collecting Kanan #1-12 on Dec. 20. 3/21/16 3/21/16 Hardcover Trade Darth Vader - Vol. 2 (Hardcover) collecting Vader Down #1 / Star Wars #13-14 / Darth Vader #13-15 / DV Annual #1 / Darth Vader #16-19 on Nov. 15. 3/20/16 3/20/16 Reference Rogue One: Ultimate Visual Guide on Dec. 16 at 200 pages. 3/18/16 3/18/16 Novel Catalyst on Oct. 4 w/ unannounced author. A prequel to Rogue One. 3/18/16 3/18/16 Comic One-Shot ??? Rogue One related one-shot in Oct.
3/18/16 3/18/16 Comic Mini-Series (3-parts) ??? Rogue One related mini in Oct.
3/14/16 3/14/16 Hardcover Trade ??? (Hardcover) collecting Princess Leia #1-5, Lando #1-5, and Chewbacca #1-5 on Nov. 15. 3/14/16 3/14/16 Trade Paperback Darth Vader - Vol. 4 collecting Darth Vader #20-25 on Nov. 1. 3/09/16 3/9/16 Short Stories Tales From a Galaxy Far, Far Away: Vol. 1 - Aliens The two new short stories will be called "True Love" and "A Recipe for Death". 3/07/16 3/7/16 YA Book ??? on Oct. 11 by Emily Kate Johnston at 400 pages. 3/07/16 3/7/16 Hardcover Trade Shattered Empire (Hardcover) collecting Shattered Empire #1-4 and the one-shot C-3PO #1 on Sept. 13. 3/04/16 3/4/16 Comic Mini-Series (5-parts) Han Solo in June. Written by Marjorie Liu and illustrated by Mark Brooks. Set in c. 3-4 ABY (between "The Empire Strikes Back" and "Return of the Jedi"). 2/29/16 2/29/16 Trade Paperback Star Wars - Vol. 4 collecting Star Wars #21-?? on Nov. 15. 2/28/16 2/28/16 Reference Complete Locations on Oct. 4. An updated edition of the Legends release (w/ only 152 pages vs. 176 in Legends). It's unknown how much material from the previous release will stay in this edition and become canon. 2/28/16 2/28/16 YA Book Adventures in Wild Space #4 will be called The Dark. 2/28/16 2/28/16 YA Book Adventures in Wild Space #3 will be called The Steal. 2/20/16 2/20/16 Comic One-Shot Star Wars #20 will be the 3rd entry from Ben Kenobi's Journal. 2/16/16 2/16/16 Story Arc Darth Vader #20-25 will be calld End of Games. 2/13/16 2/13/16 Reference Galactic Atlas No U.S. release has been announced. 80 pages of illustrated maps covering all 7 movies, Rebels, The Clone Wars, novels, and comics. 2/13/16 2/13/16 Young Adult Series Adventures in Wild Space I've delayed including this series (originally announced on Nov. 10) because there still isn't any mention of a U.S. release. With the U.K. release less than 2 weeks away, I've decided to add it with this note. 2/02/16 2/2/16 Non-Fiction TOTTCS: Vol. 3 - Return of the Jedi on Aug. 16 by Gary Gerani. Collects all 220 Topps cards and 55 stickers from the 1983 series. 1/20/16 1/20/16 Comic One-Shot C-3PO #1 will be called Phantom Limb. 1/19/16 1/19/16 Young Adult Series Join the Resistance: Book #1 on Sept. 13 at 240 pages. 1/19/16 1/19/16 Story Arc Darth Vader #16-19 will be calld The Shu-Torun War. 1/14/16 1/14/16 Comic Series Poe Dameron ongoing series in April. 12/30/15 12/30/15 Story Arc Obi-Wan & Anakin mini-series is simply titled Obi-Wan and Anakin. 12/20/15 12/20/15 Adaptation The Force Awakens - A Junior Novel is the full title of the junior novelization. 12/20/15 12/20/15 Hardcover Trade Star Wars - Vol. 1 (Hardcover) collecting Star Wars #1-12 on Sept. 20. 12/13/15 12/13/15 Reference On the Front Lines: Notes on Tactics, Armor and Valor from Galactic Conflicts in Fall 2016 by Daniel Wallace at 128 pages. 12/13/15 12/13/15 Reference Propaganda: A History of Persuasive Art in the Galaxy in Fall 2016 by Pablo Hidalgo at 112 pages. Collects in-universe artwork history. 12/11/15 12/11/15 Trade Paperback Darth Vader - Vol. 3 collecting Darth Vader #16-19 and DV Annual #1 on Aug. 9. 12/10/15 12/10/15 Comic Annual Darth Vader: Annual #1 story is simply titled "Darth Vader: Annual". 12/3/15 12/3/15 Trade Paperback Obi-Wan & Anakin collecting all 5 issues of the mini-series on July 19. 12/3/15 12/3/15 Comic Annual Star Wars: Annual #1 story is simply titled "Star Wars: Annual". 12/2/15 12/2/15 Trade Paperback Star Wars - Vol. 3 collecting Star Wars #15-20 on Aug. 16. 11/30/15 11/30/15 TV Season Star Wars: Rebels  Season 3 in Fall 2016. No word yet on episode count. 11/18/15 11/18/15 Comic Magazine Star Wars: Rebels  Magazine #3 on Feb. 17 will contain 2 comics. The panel on the cover isn't from any of the first 8 issues of the UK edition. 11/18/15 11/18/15 Graphic Novel The Empire Strikes Back: Artist's Edition on Apr. 13. Collects all of Al Williamson's ESB art and other select Star Wars art. 11/17/15 11/17/15 Story Arc Star Wars #16-?? will be called Rebel Jail. 11/16/15 11/16/15 DVD/Blu-ray The Force Awakens is rumored to be released on Apr. 5 due to several book release dates being moved to that date. 11/2/15 11/2/15 Trade Paperback Kanan - Vol. 2: First Blood collecting the Kanan #7-11 arc and #12, which will likely be a one-shot, on May 3. 10/14/15 10/14/15 Story Arc Chewbacca mini-series is simply titled Chewbacca. 10/13/15 10/13/15 Short Story Inbrief is the title of Janine K. Spendlove's Battlefront: Twilight company tie-in short story in Insider #161. 10/10/15 10/10/15 eNovellas Tales From a Galaxy Far, Far Away: Aliens On Dec. 1, four of the six short stories in this Apr. 26 book by Landry Walker will be released as eNovellas: "High Noon on Jakku", "All Creatures Great and Small", "The Face of Evil", "The Crimson Corsair and The Lost Treasure of Count Dooku". 10/10/15 10/10/15 Short Story Bait (Insider #162) on Dec. 22 by Alan Dean Foster. 10/10/15 10/10/15 eNovella The Perfect Weapon on Nov. 24 by Delilah S. Dawson. 10/10/15 10/10/15 Comic Mini-Series (5-parts) Obi-Wan & Anakin in Jan. Written by Charles Soule and illustrated by Marco Checchetto. Set in c. 28 BBY. 10/10/15 10/10/15 Novel New Republic: Bloodline is the title of the Mar. 29 novel by Claudia Gray. Set 6 years before Episode VII: The Force Awakens (c. 28 ABY). 10/10/15 10/10/15 Novel Aftermath: Empire's End is the title of the last book in the trilogy to be released in 2017 by Chuck Wendig. 10/10/15 10/10/15 Novel Aftermath: Life Debt is the title of the May 31 novel (was June 14) and the second book in the trilogy by Chuck Wendig. 9/25/15 9/25/15 YA Book Before the Awakening is the title of the Dec. 18 character novel starring Poe, Rey, and Finn. Greg Rucka writes this book set pre-TFA. 9/22/15 9/22/15 Trade Paperback Star Wars - Vol. 3: Vader Down collecting Vader Down #1, Star Wars #13-14, and Darth Vader #13-15 on Apr. 19. 9/17/15 9/17/15 Novel Untitled Del Rey Novel (ISBN: 978-1-101-96693-8) on June 14, 2016. No other info is known. The timing suggests it could be the second Aftermath book. 9/15/15 9/15/15 Comic Magazine Star Wars: Rebels - Magazine on Nov. 11. The U.K. magazine that features a 12-page Rebels comic in each issue is coming to the U.S. but may skip every other issue of the U.K. edition. Issues #1 and #2 have been announced but the U.S. #2 appears to be the contents of the U.K.s #3. 9/15/15 9/15/15 Comic Annual Darth Vader: Annual #1 on Dec. 16. 9/15/15 9/15/15 Comic Annual Star Wars: Annual #1 on Dec. 9. 9/10/15 9/10/15 Story Arc Kanan #6 will be called Haunt. 9/09/15 9/09/15 Story Arc Shattered Empire mini-series is simply titled Shattered Empire. 8/18/15 8/18/15 Short Story Story in Insider #160 is titled Blade Squadron: Zero Hour. 8/14/15 8/14/15 Non-Fiction The Making of Star Wars: The Force Awakens on Mar. 15, 2016 w/ 376 pages. 8/14/15 8/14/15 Reference Star Wars Character Encyclopedia - Updated and Expanded on Apr. 5, 2016. An updated edition of the Legends release w/ 16 new pages (224 pages total) of The Force Awakens material. 8/13/15 8/13/15 Non-Fiction TOTTCS: Star Wars Galaxy on Mar. 15, 2016 by Gary Gerani and Drew Struzan. Collects all of the "New Vision" Topps card series. 8/13/15 8/13/15 Non-Fiction TOTTCS: Vol. 2 - The Empire Strikes Back on Apr. 19, 2016 by Gary Gerani. Collects all 353 Topps cards and 88 stickers from the 1980 series. 8/10/15 8/10/15 Short Story Mercy Mission by Melissa Scott in The Rise of the Empire. Featuring a young Hera sometime between 19-11 BBY. 8/10/15 8/10/15 Short Story Bottleeck by John Jackson Miller in The Rise of the Empire. Featuring a tense alliance with Tarkin and Count Vidian sometime between 14-11 BBY. 8/10/15 8/10/15 Short Story The Levers of Power by Jason Fry in The Rise of the Empire. Featuring Rae Sloane commanding the Vigilance during the Battle of Endor in 4 ABY. 7/29/15 7/29/15 Story Arc Kanan #7-11 will be called First Blood. 7/27/15 7/27/15 Story Arc Darth Vader #13 will be called Vader Down (Pt. 2 of 6). 7/27/15 7/27/15 Story Arc Vader Down will be called Vader Down (Pt. 1 of 1) despite continuing in Darth Vader #13 as "Vader Down (Pt. 2 of 6)". 7/23/15 7/23/15 Comic One-Shot Last of His Breed, The is assumed to be the title of Star Wars #7, the Ben Kenobi one-shot. Based on it being in quotes in the opening crawl and there's no comma preceding it so it isn't just a description. 7/17/15 7/17/15 Reference Creatures of the Outer Rim , the previously untitled "Alien Book" that was listed as a YA Book is actually a Reference book. 7/11/15 7/11/15 Comic One-Shot Vader Down in Nov. leading in to crossovers with Star Wars and Darth Vader, presumably in issues #13 (new arc) for both series. Written by Jason Aaron and Kieron GIllen and drawn by Mike Deodato and Salvador Larroca. 7/10/15 7/10/15 Comic Mini-Series (5-parts) Chewbacca in Oct. written by Gary Dugan and illustrated by Phil Noto. Set some time after Episode IV. 7/08/15 7/08/15 Story Arc Lando mini-series is simply titled Lando. 7/06/15 7/06/15 Story Arc Star Wars #8-12 will be called Showdown on Smuggler's Moon. 6/25/15 6/25/15 Story Arc Darth Vader #7-12 is called Shadows and Secrets. 7/11/15 7/11/15 Site News They Might Be Geeks launched. Contributors: Special thanks to everyone who makes this site possible! You can follow us @StarWarsDatapad (Timeline & Various), @starwarscodex (Novels & Reference Books), Zapik/@yoda_naughty (Various), Chad Walton (Comics), Luke (Comic Trades), Bryson (Video Games), and LCS (YA & Middle-Grade Books). Emilio Laiso Adaptation of ''Rogue One'' in 6 issues. What is Star Wars Canon? The term “canon” is used to refer to an authoritative list of media that Lucasfilm consider an authentic part of the official Star Wars history. The goal is to present a continuous and unified history of the Star Wars galaxy which is maintained by the Lucasfilm Story Group (a.k.a the “story group” or simply LSG). The LSG’s most publicly vocal members are Leland Chee and Pablo Hidalgo who often answer fan questions and clarify canonocity. On April 25, 2014, the current canon was established consisting of Episodes I-VI, The Clone Wars movie & seasons 1-6, and all future releases (with very few exceptions). The previous Expanded Universe (EU) would now be called “Legends” and exist almost exclusively as reprints with no new material. All movies, TV shows, books, short stories, comics, etc. on this site are part of the Lucasfilm Story Group official canon. Discover titles you missed on their initial release and revisit your favorite book, comic, etc. on their anniversary.